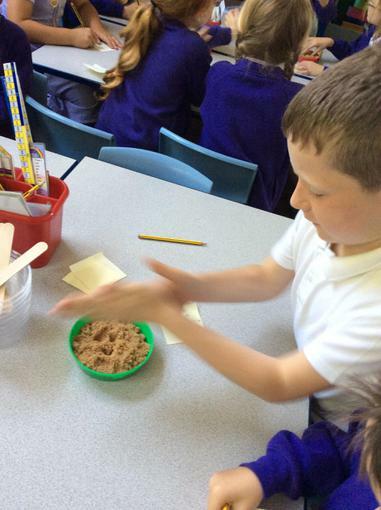 We compared sand with brown sugar using our senses. 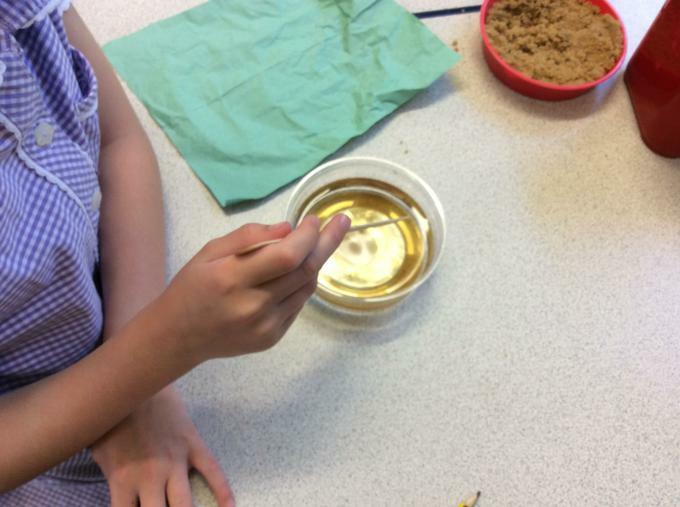 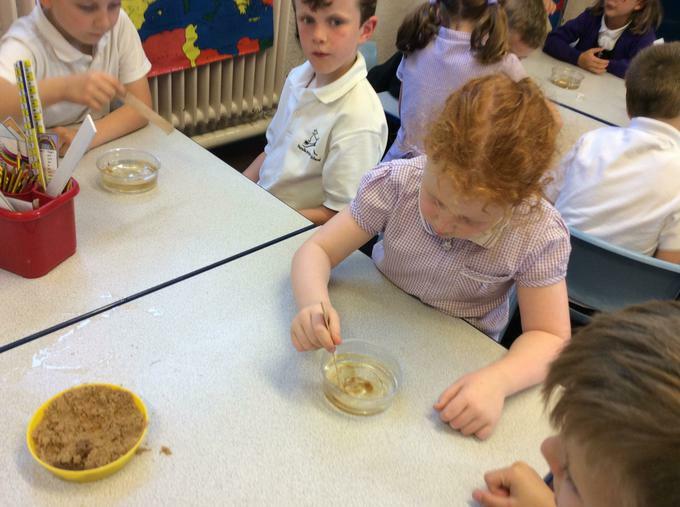 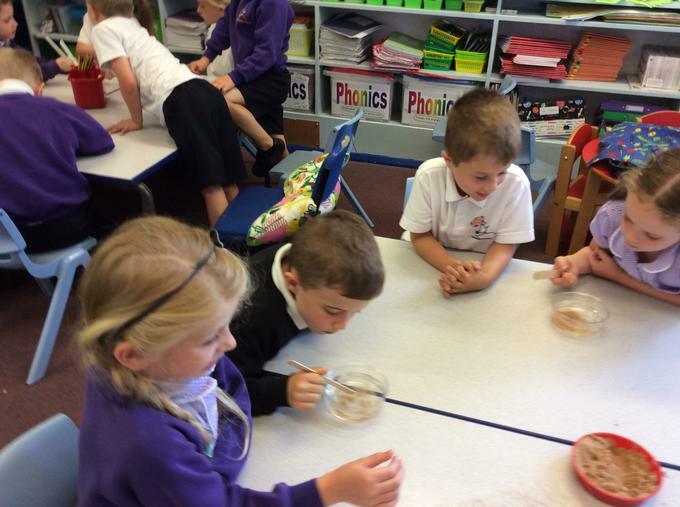 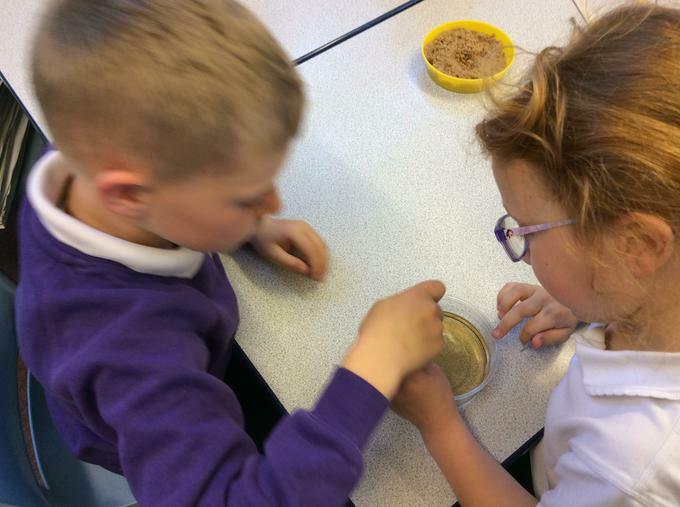 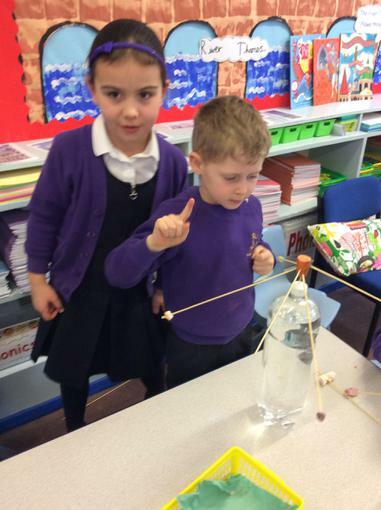 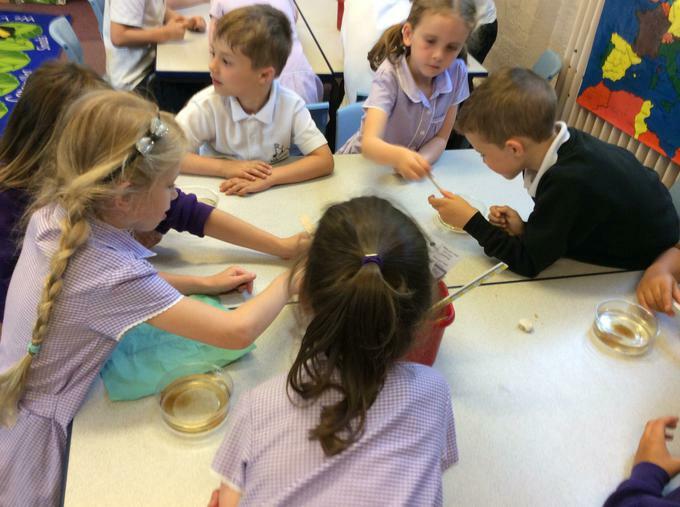 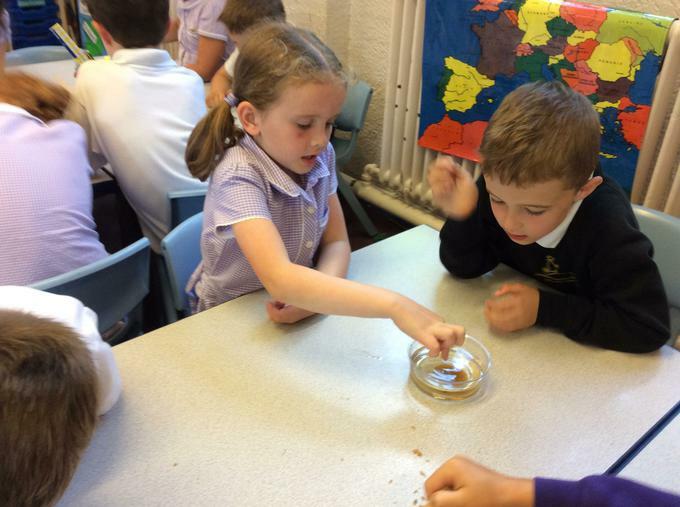 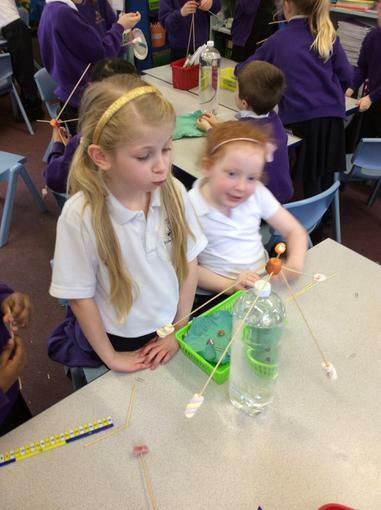 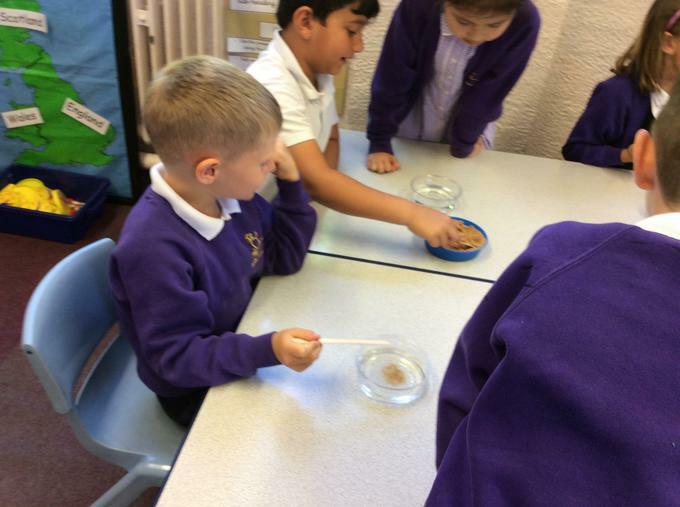 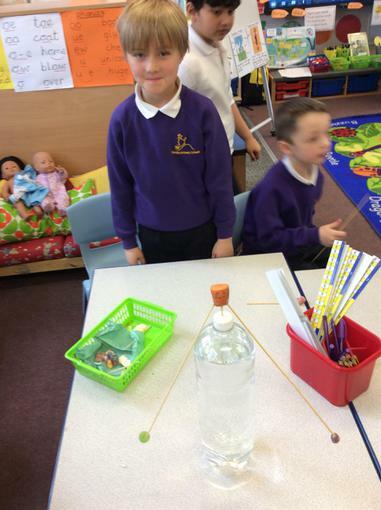 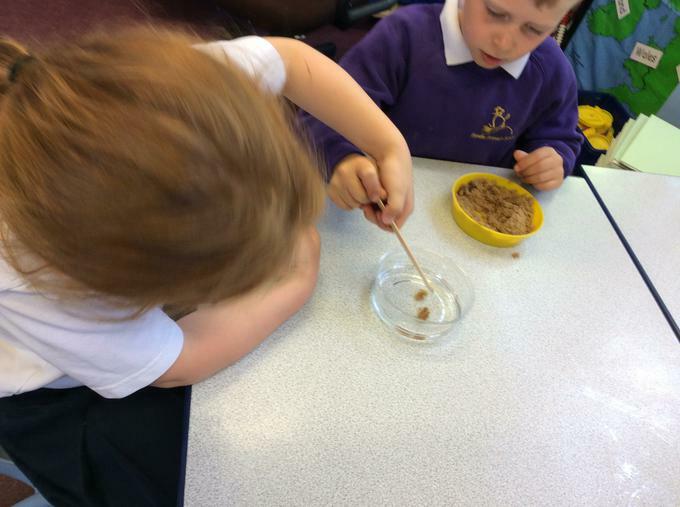 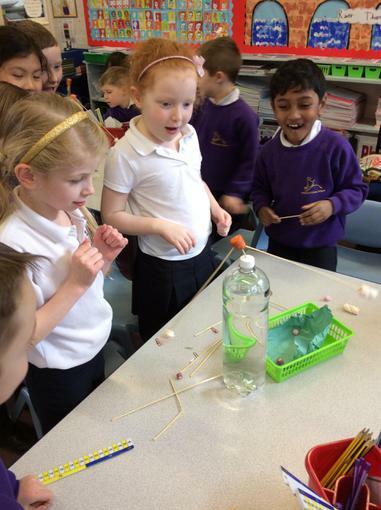 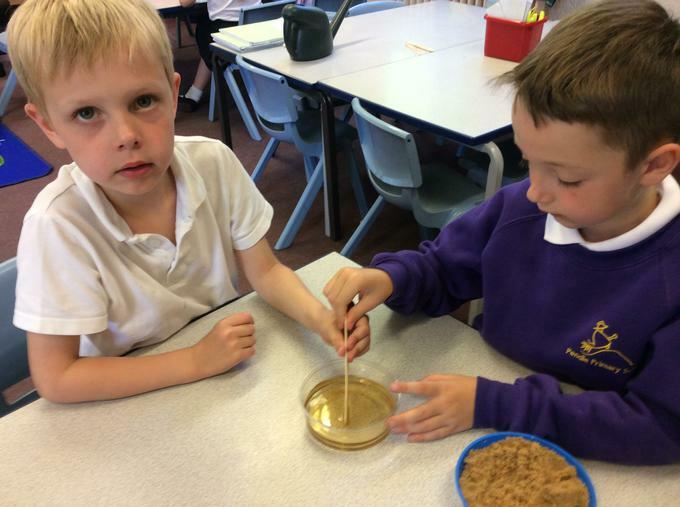 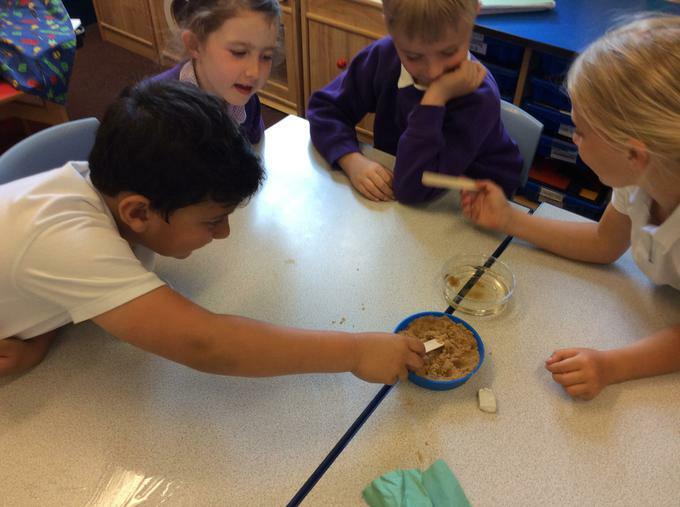 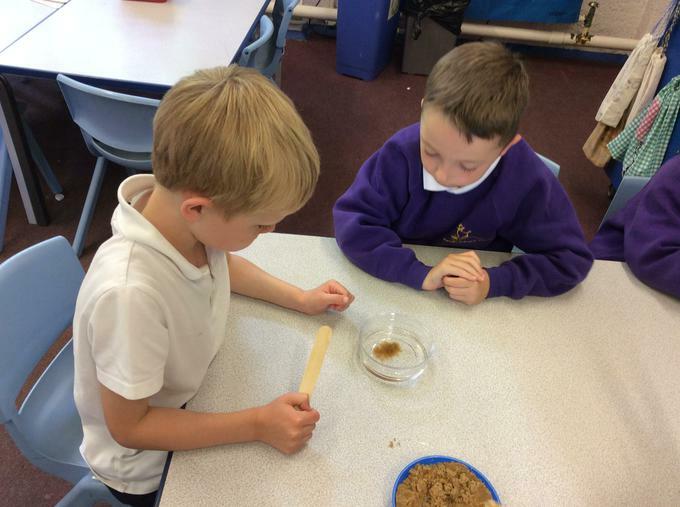 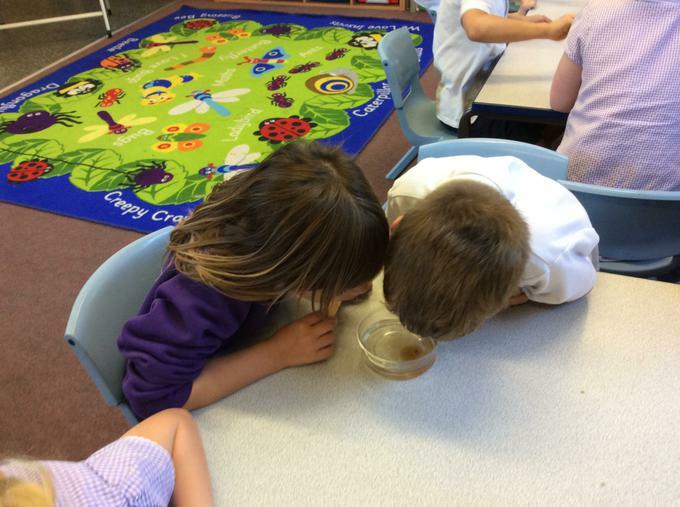 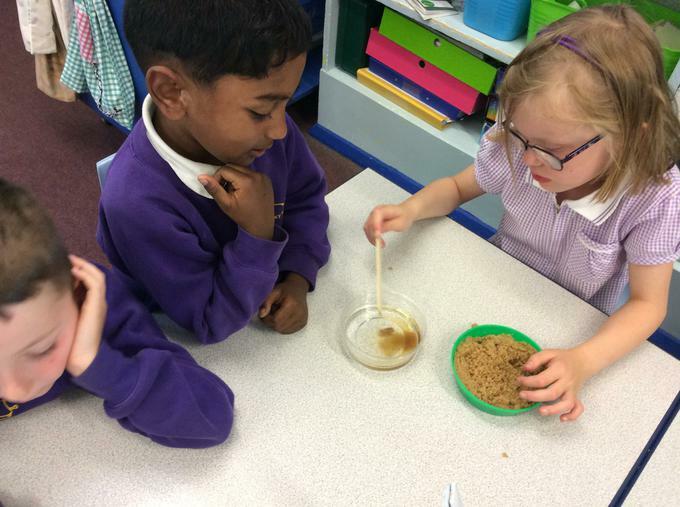 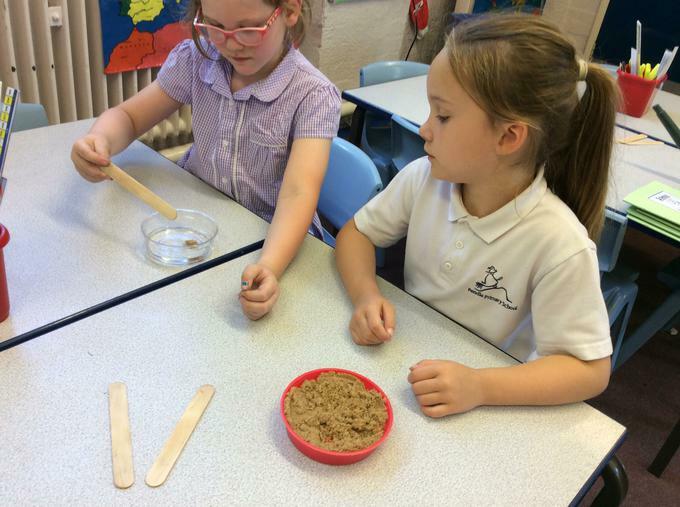 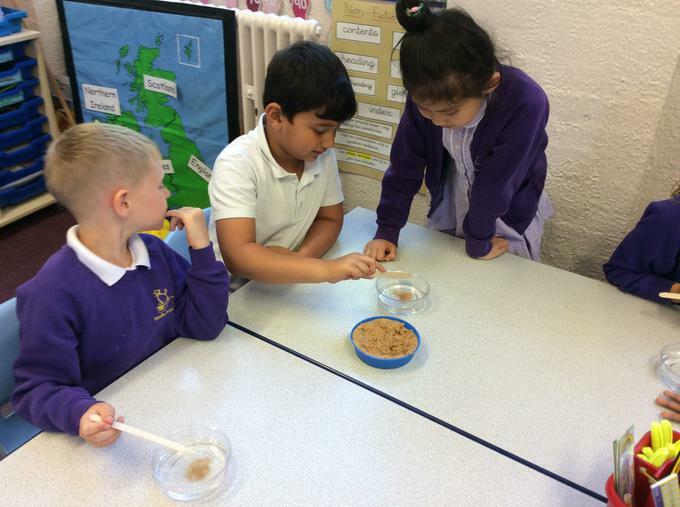 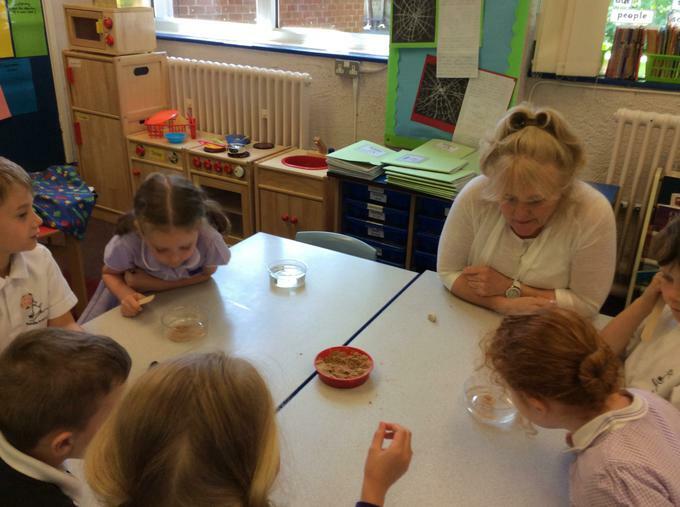 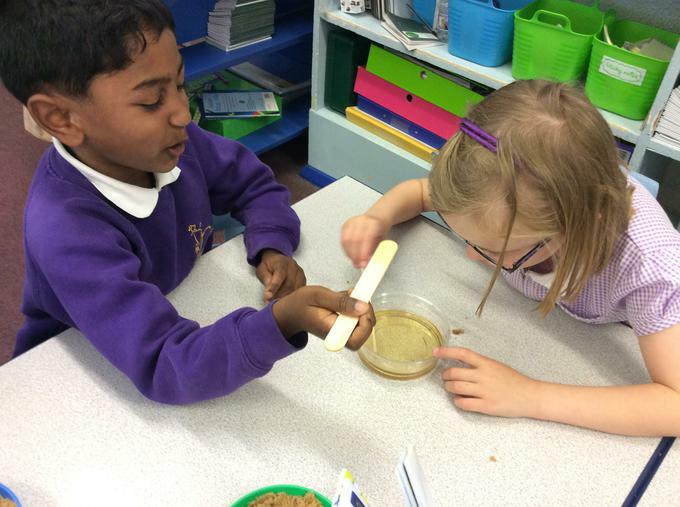 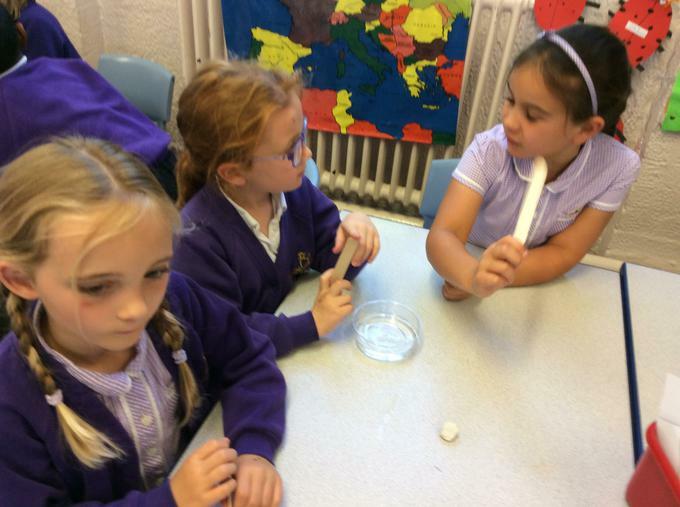 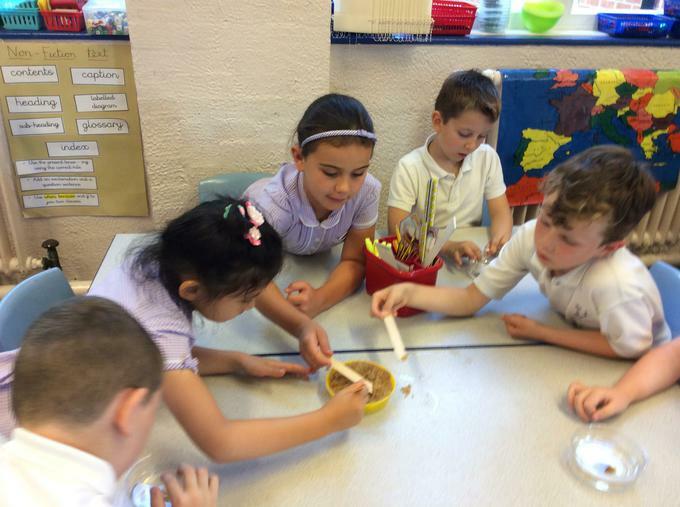 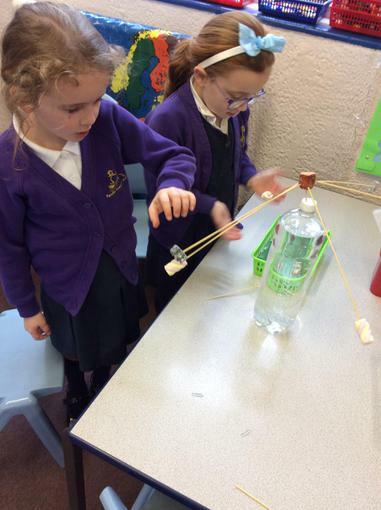 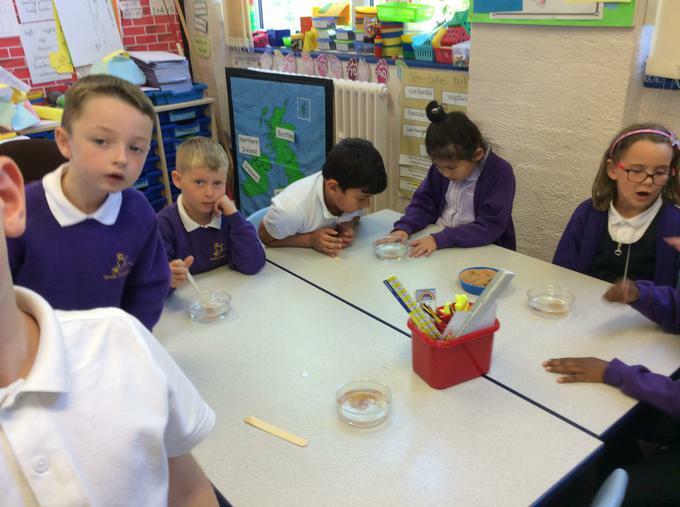 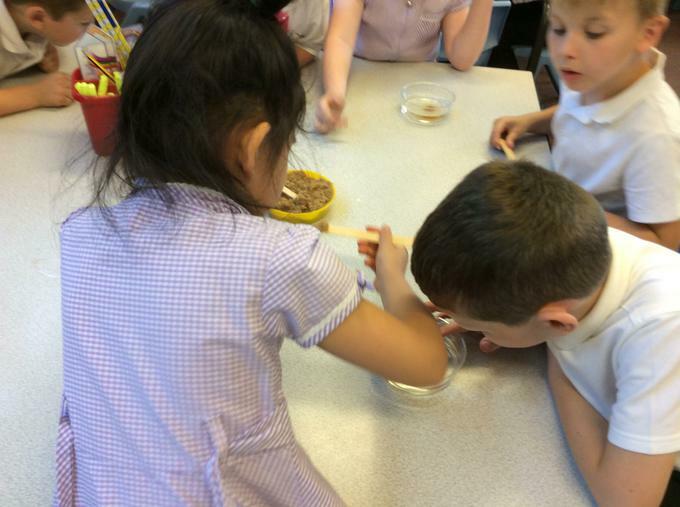 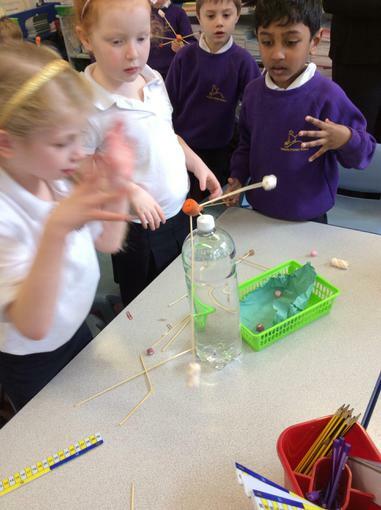 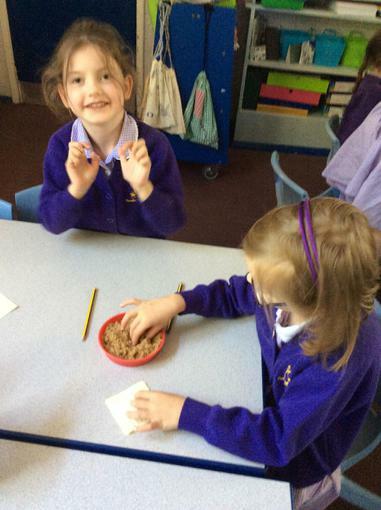 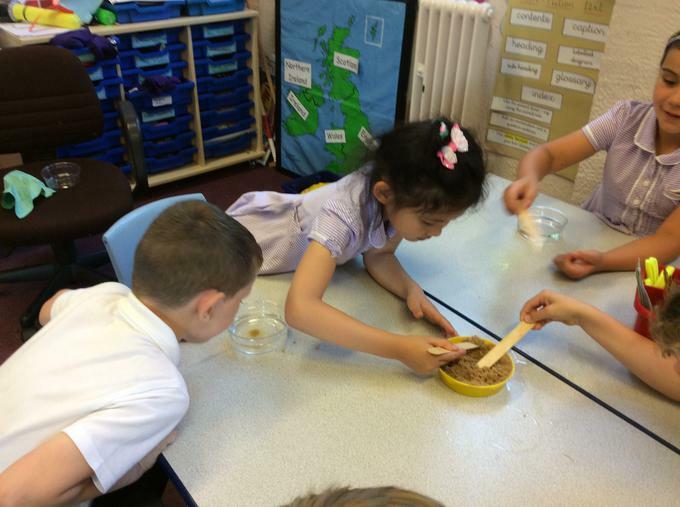 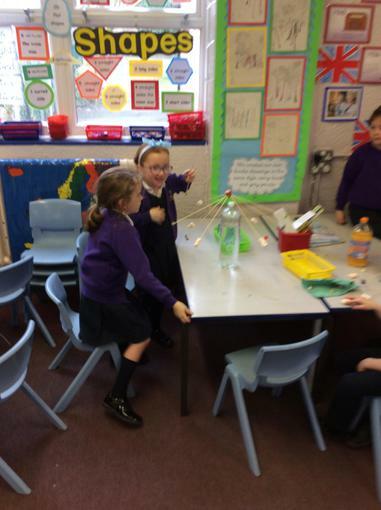 We then predicted what would happen if a teaspoon of sand or brown sugar was added to some water. 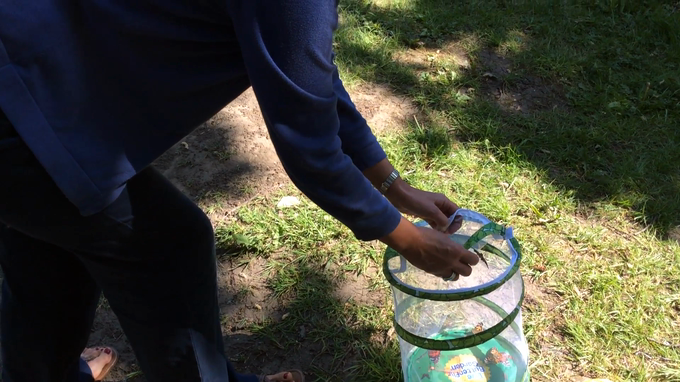 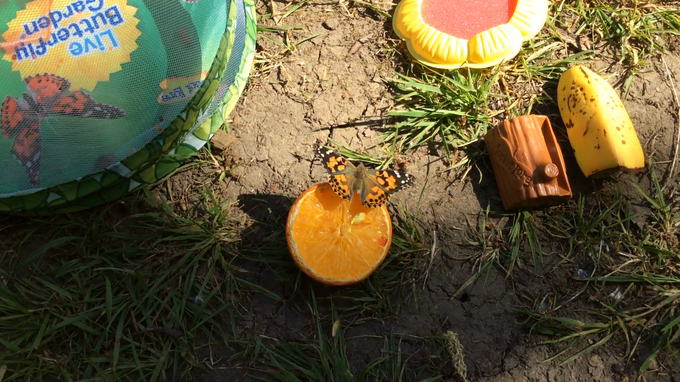 Time to release the painted ladies! 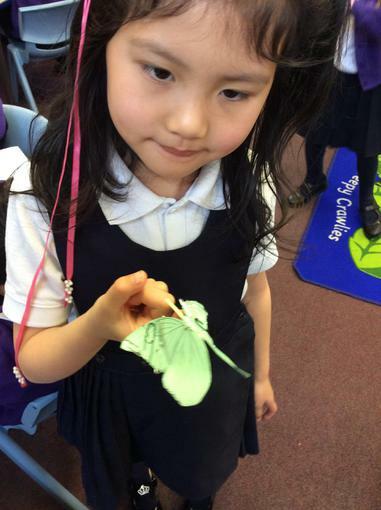 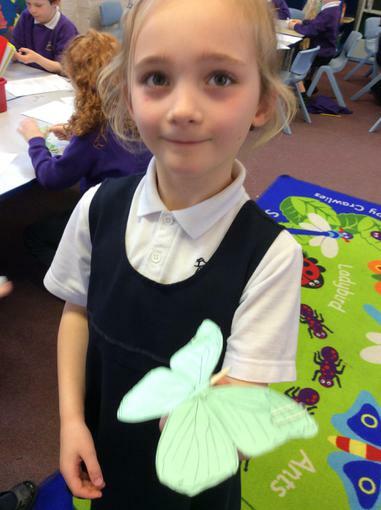 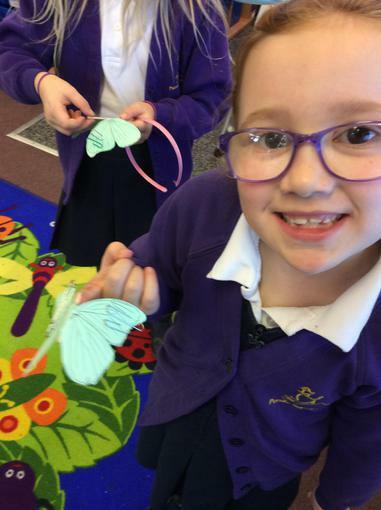 The butterflies emerged from the chrysallises after two weeks. 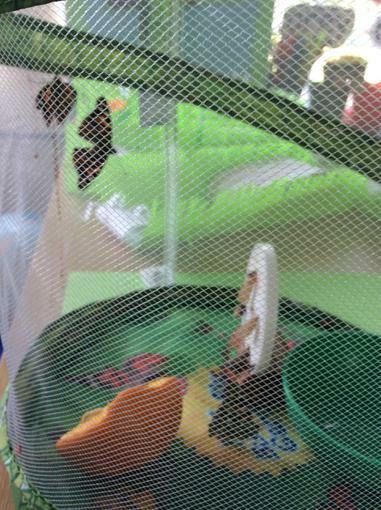 It took about an hour for the butterflies wings to dry and to stretch out to their full size. 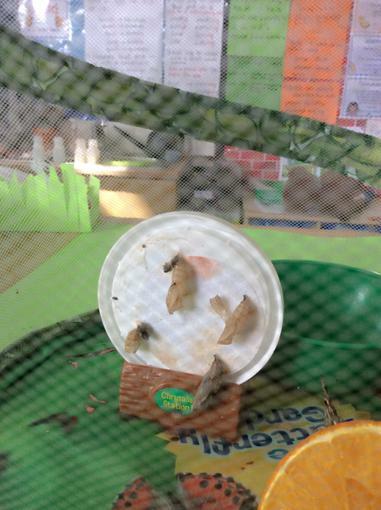 The caterpillars have stopped eating and are hanging from the top of the pot in chrysalises. 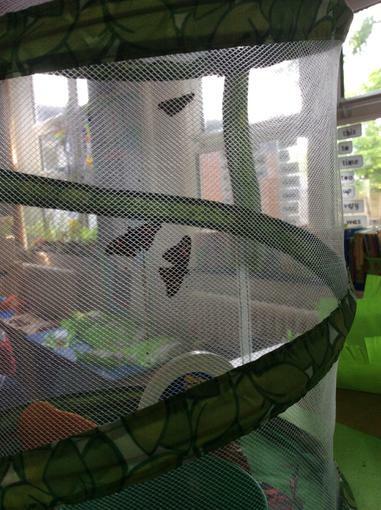 They will remain still and take between 7-10 days to transform into butterflies. 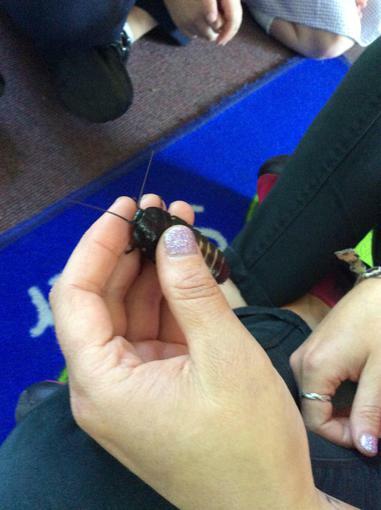 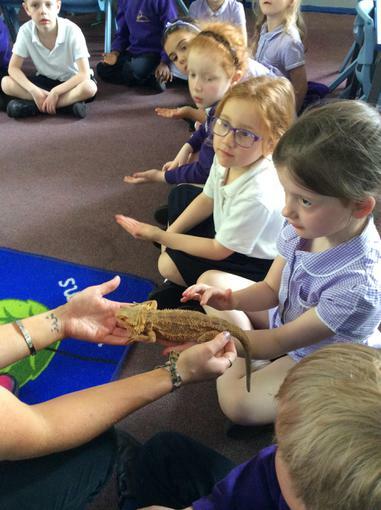 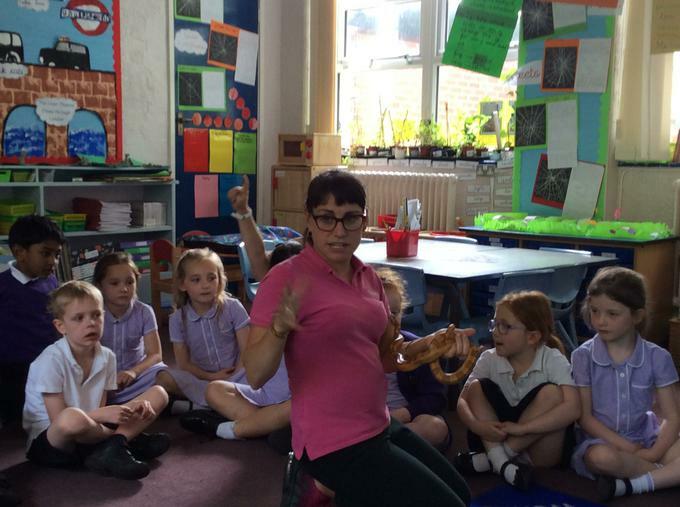 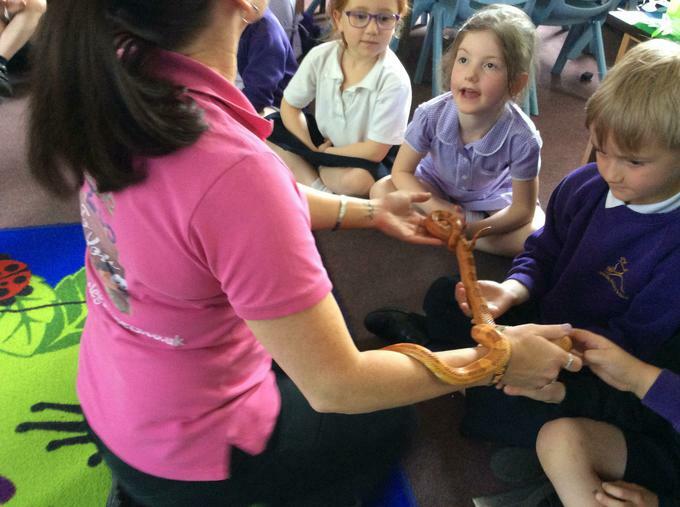 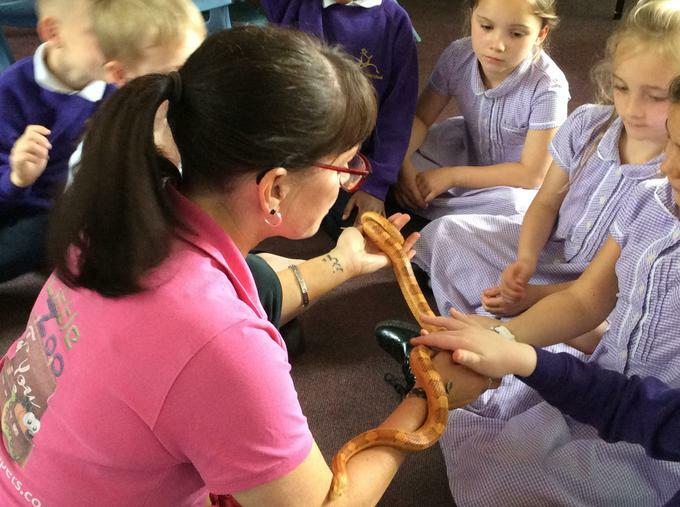 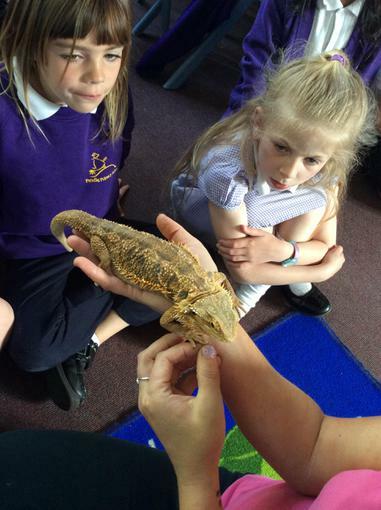 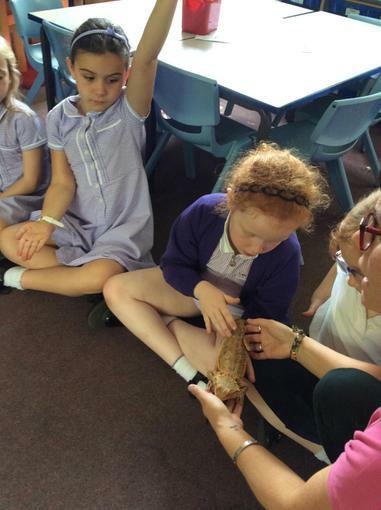 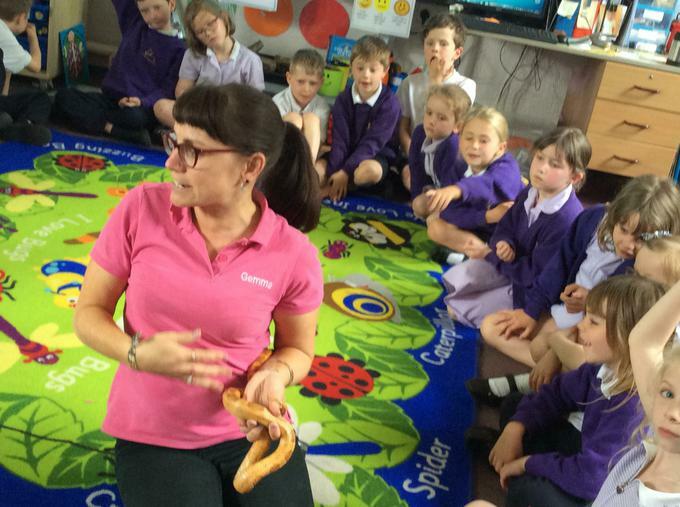 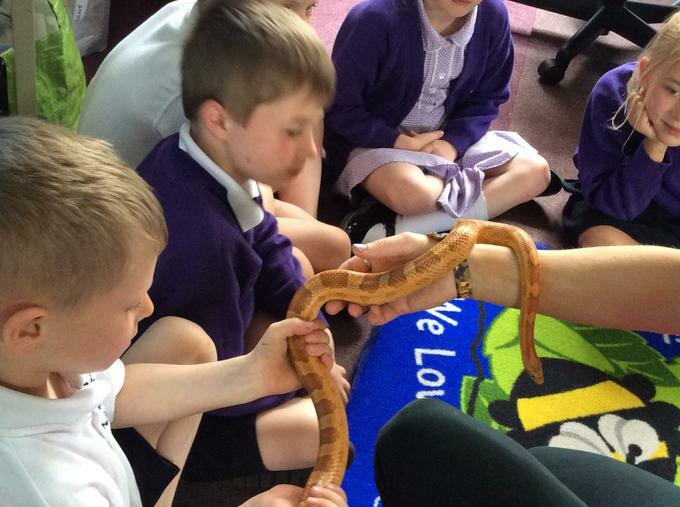 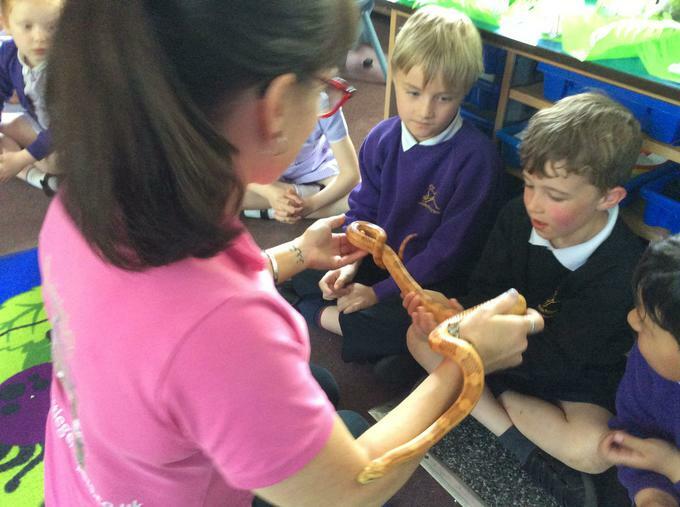 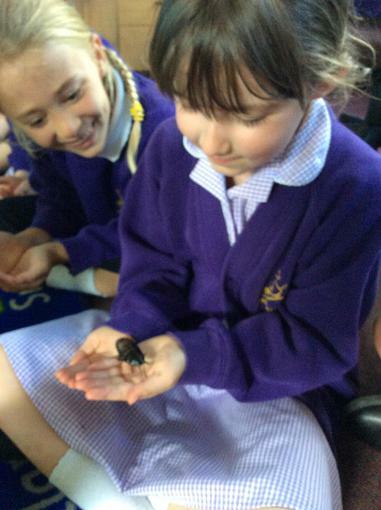 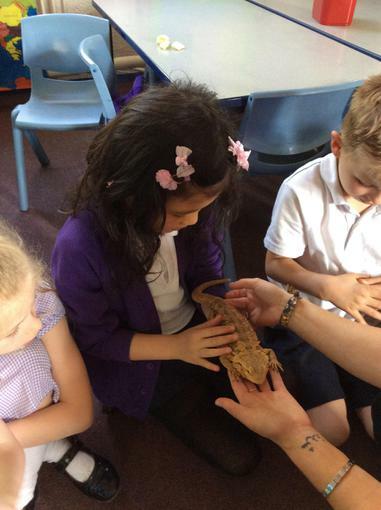 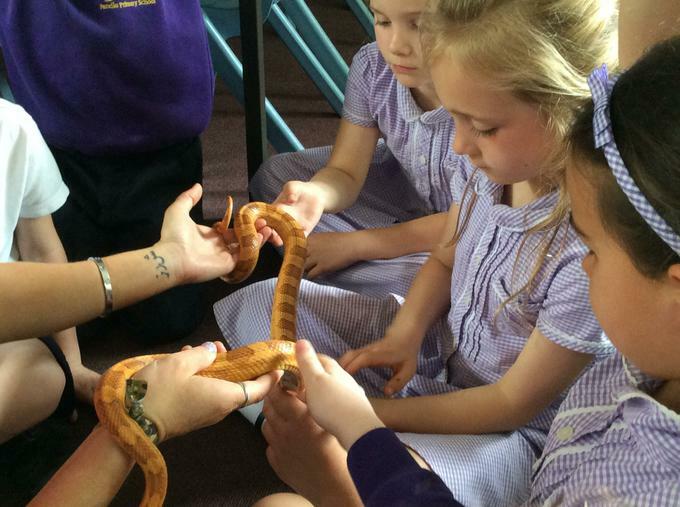 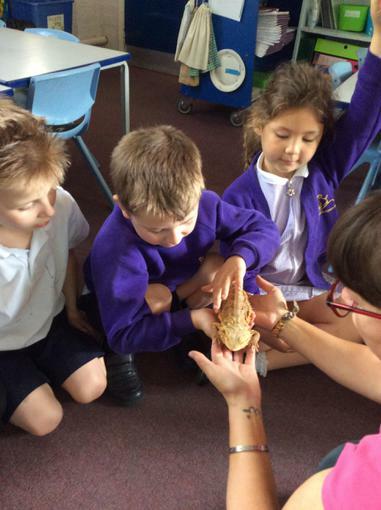 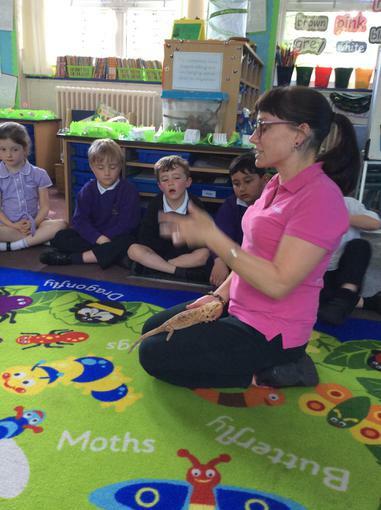 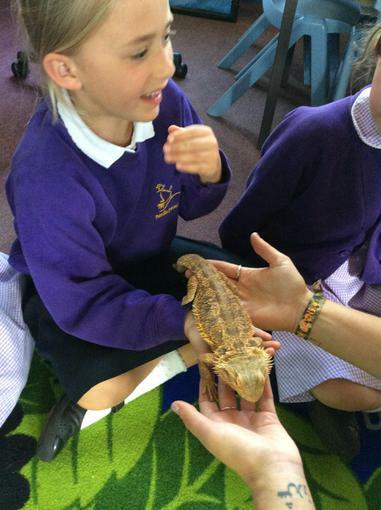 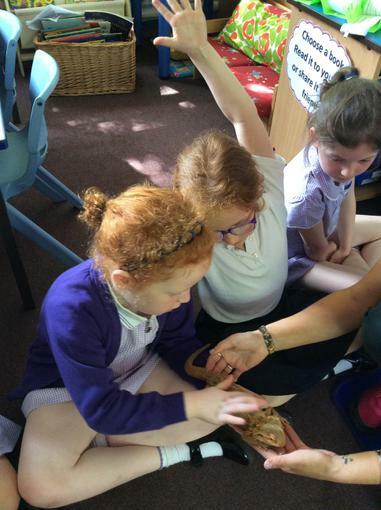 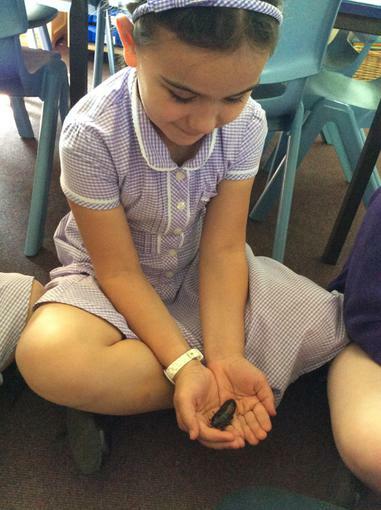 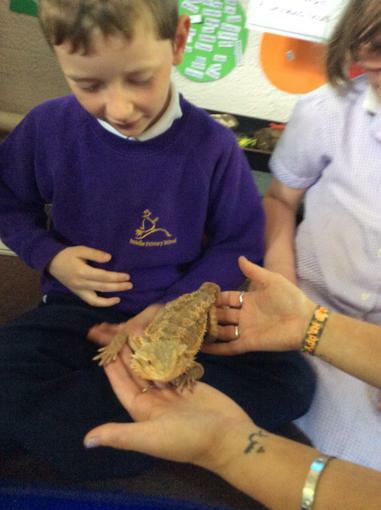 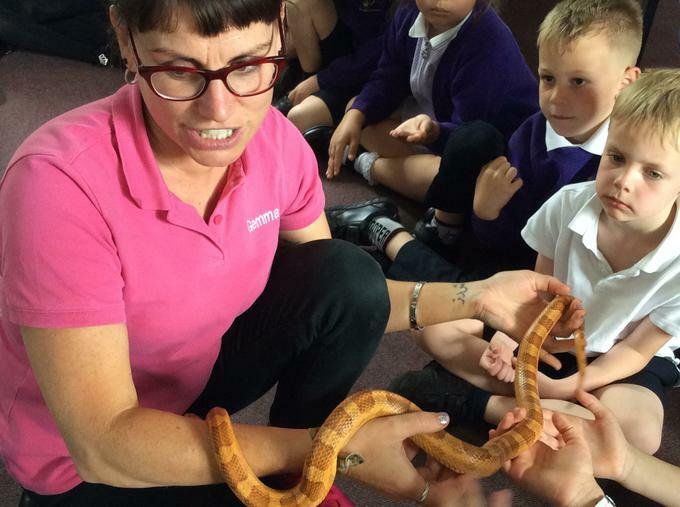 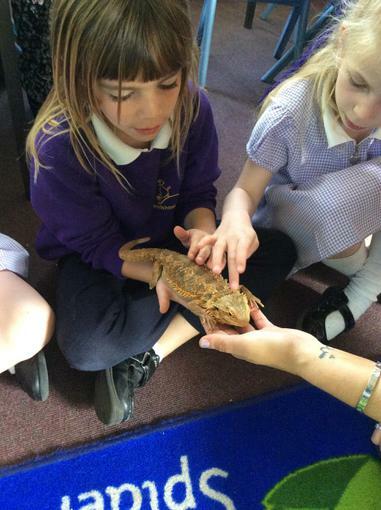 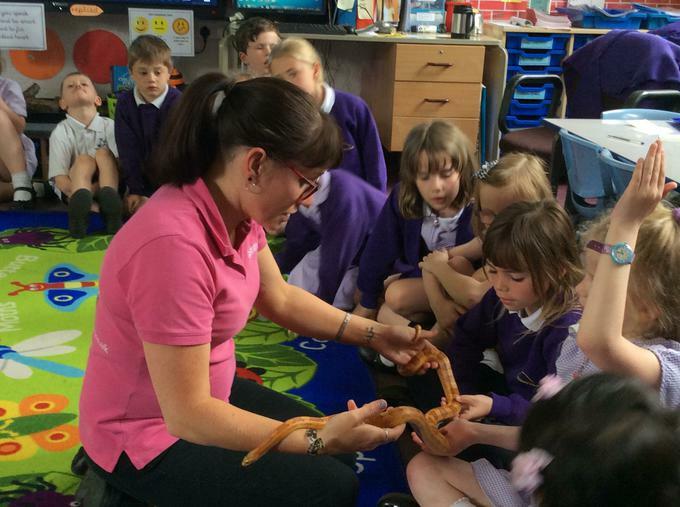 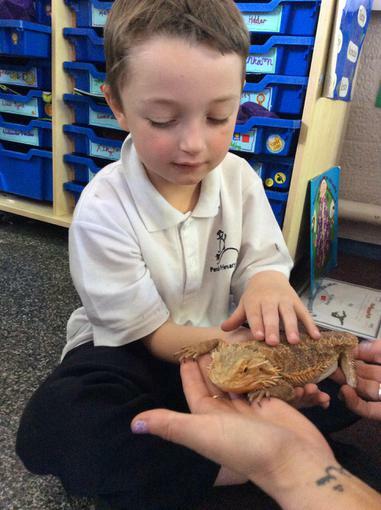 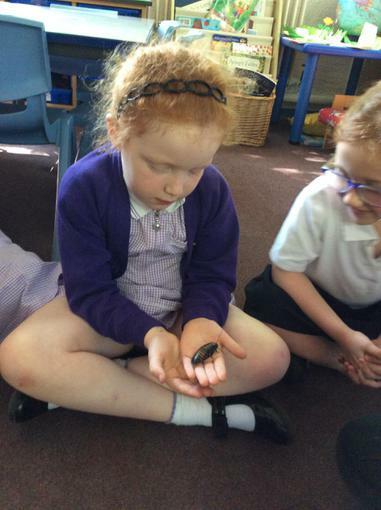 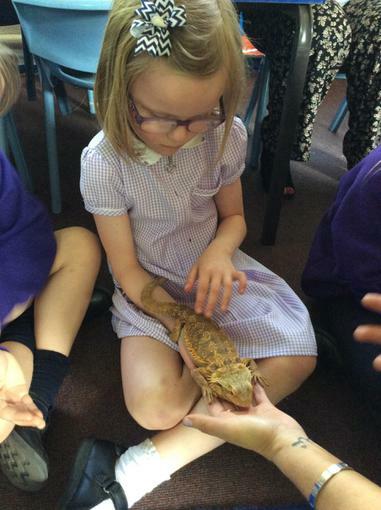 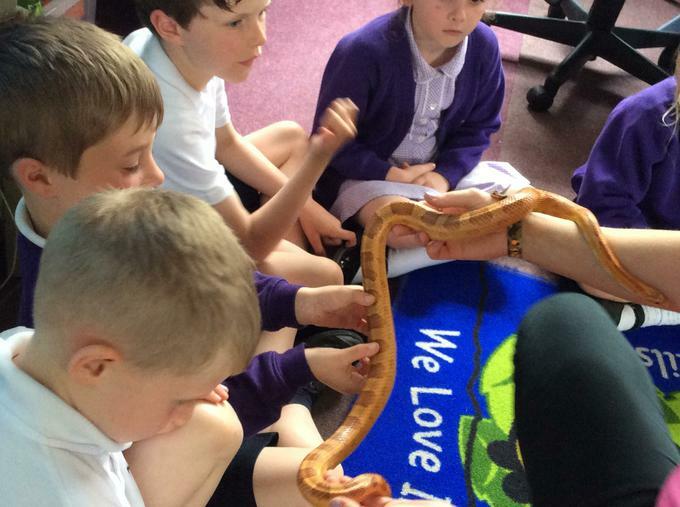 Gemma from Little Zoo came to visit our classroom. 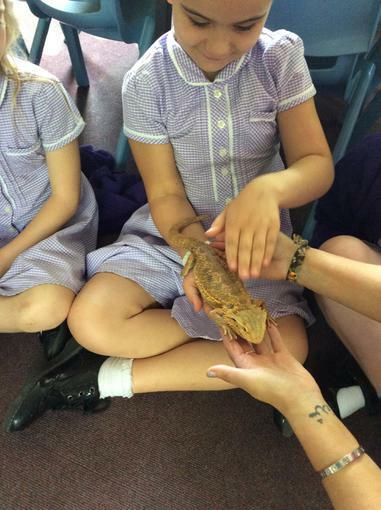 The animals in her zoo included Lego the Australian bearded dragon, Clare the Madagascan hissing cockroach, Zeus the American corn snake and Cruella the Asian Forest scorpion. 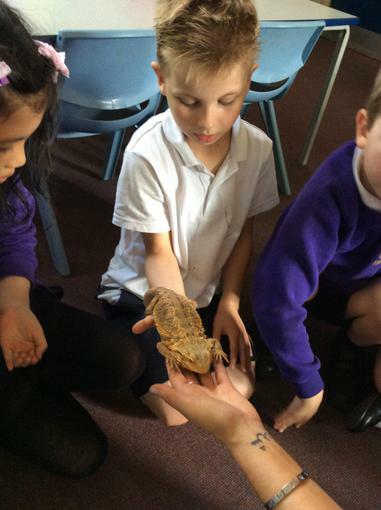 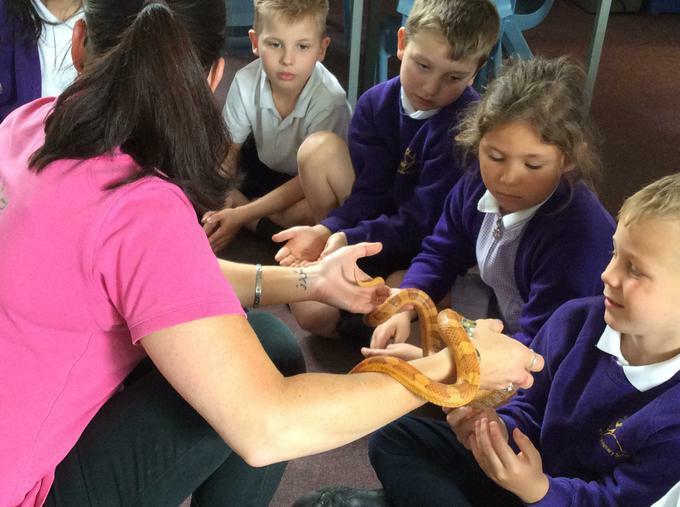 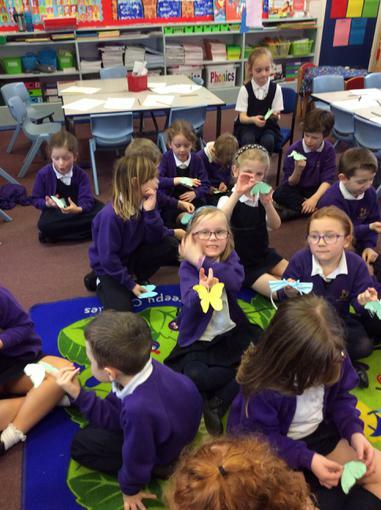 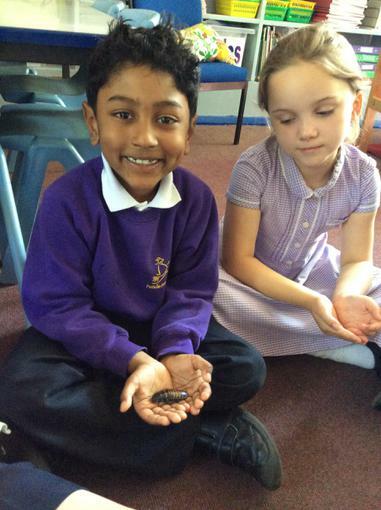 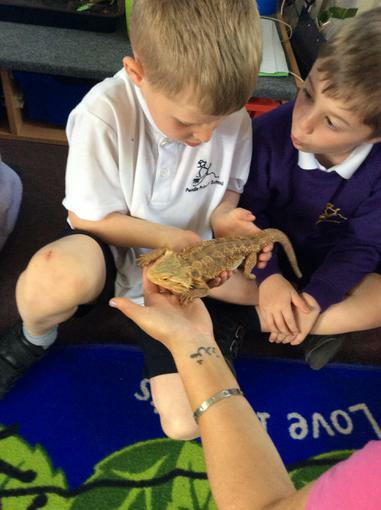 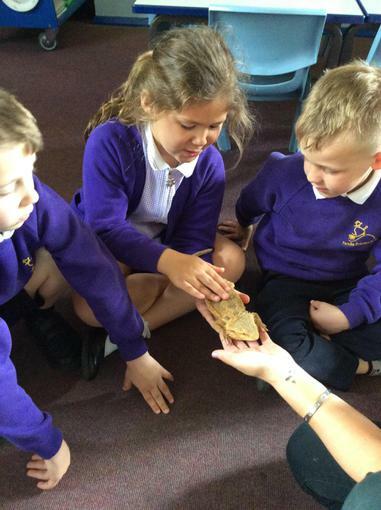 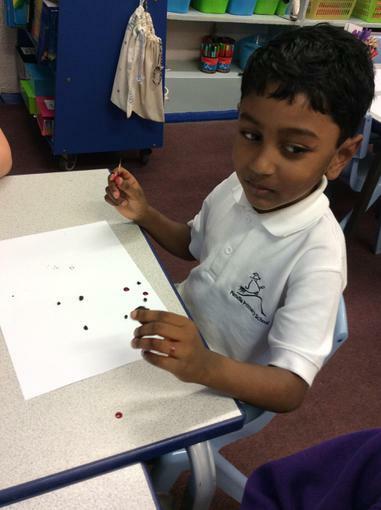 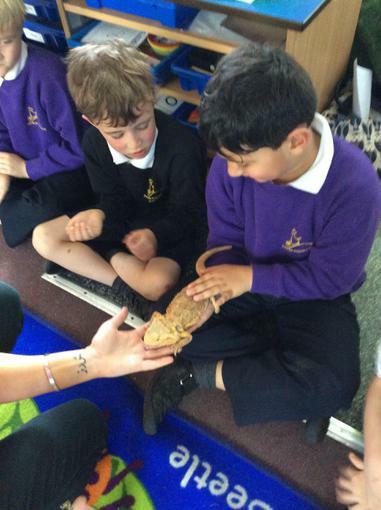 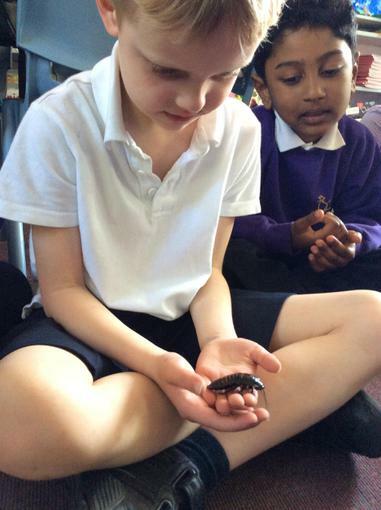 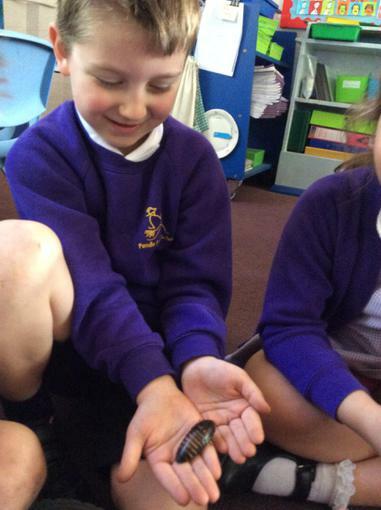 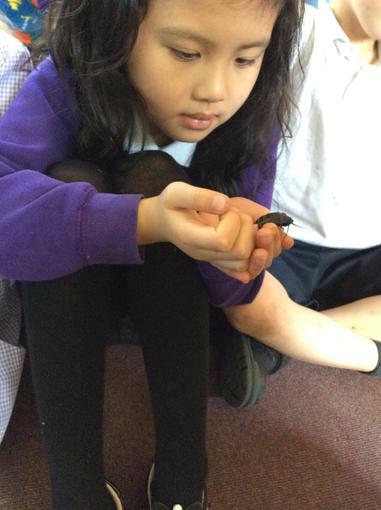 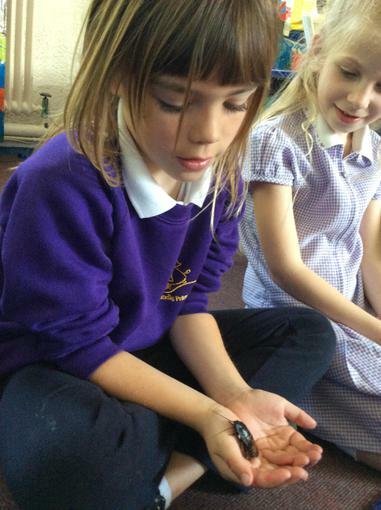 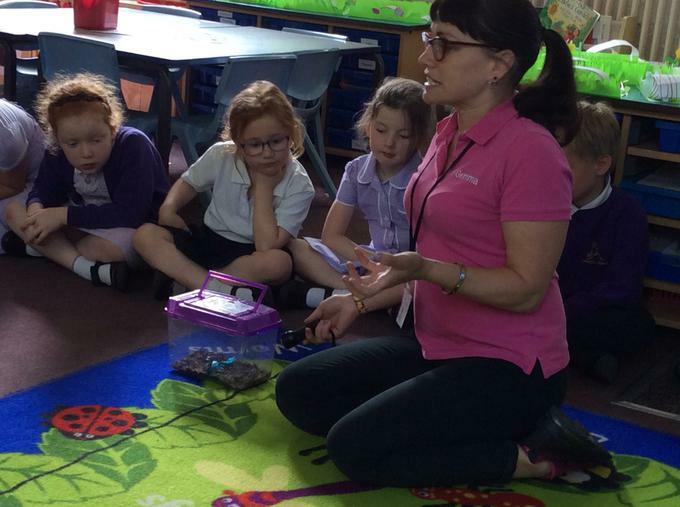 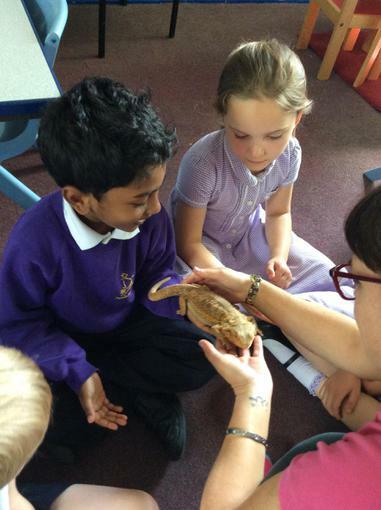 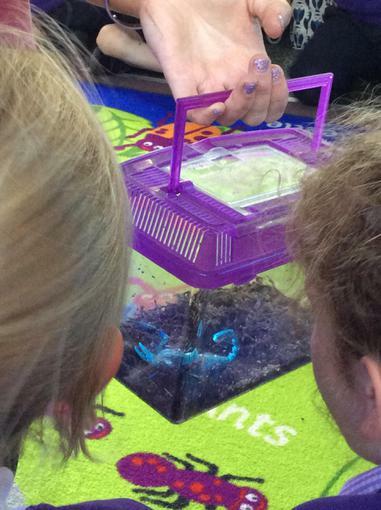 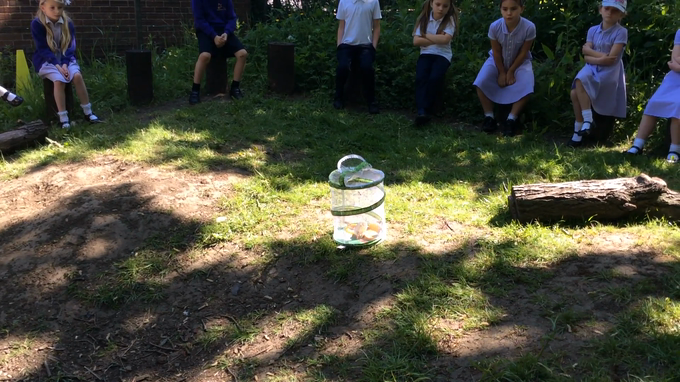 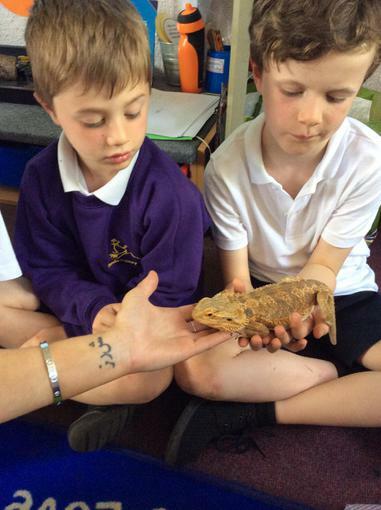 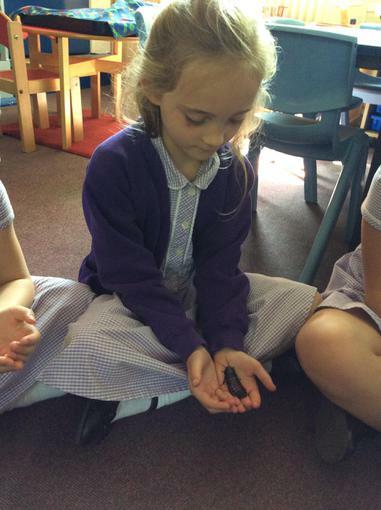 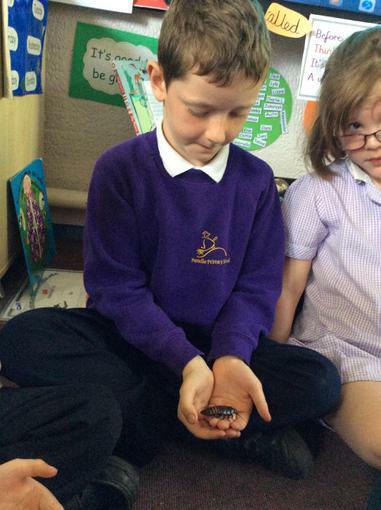 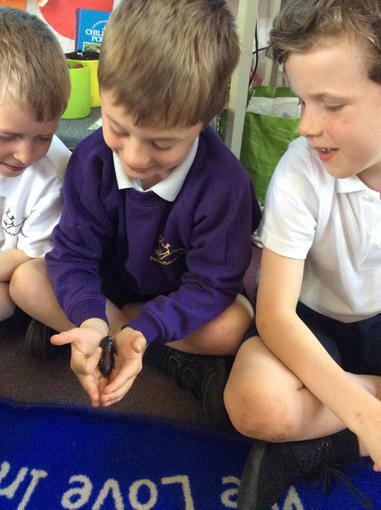 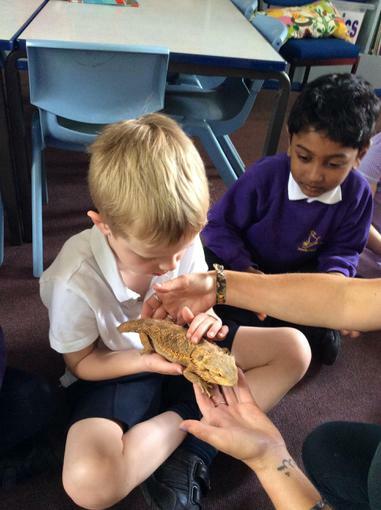 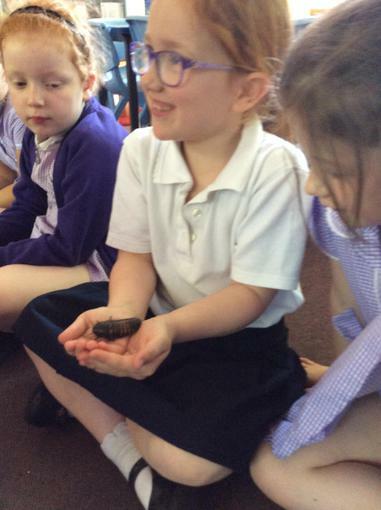 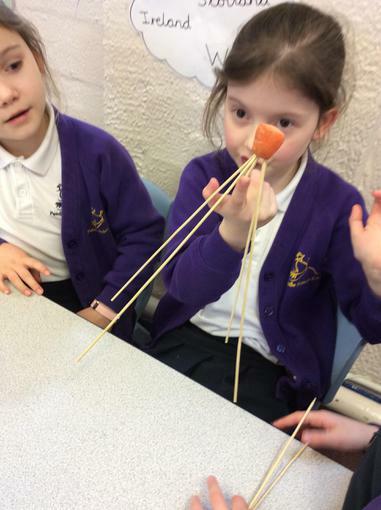 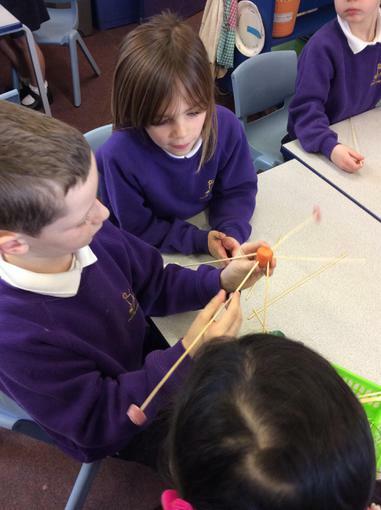 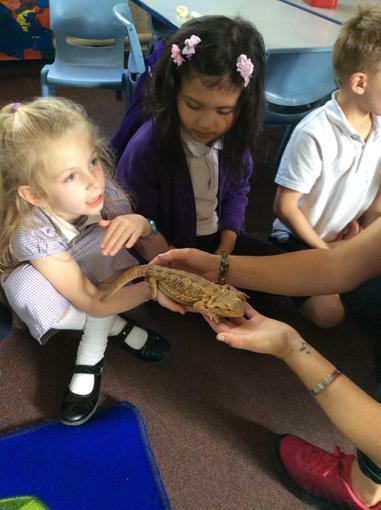 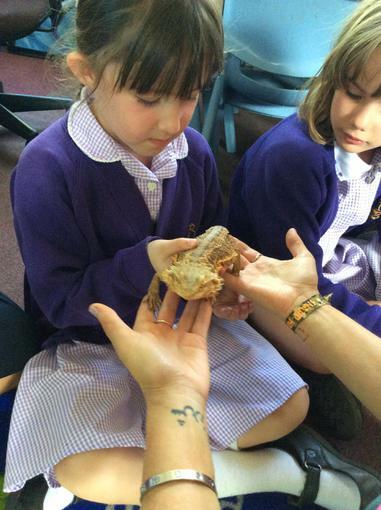 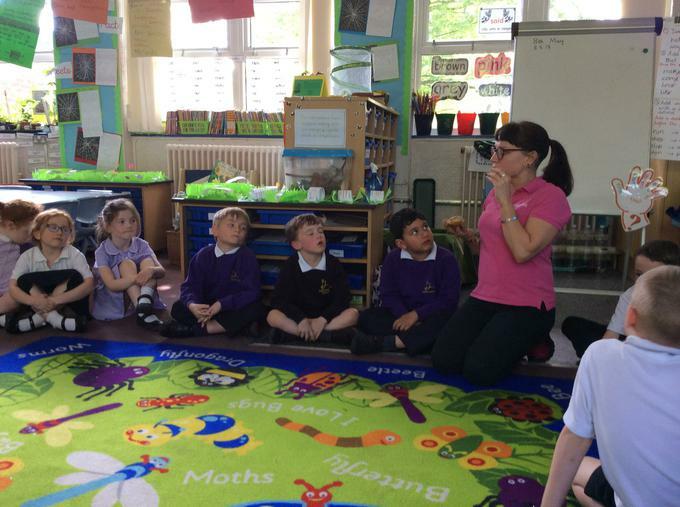 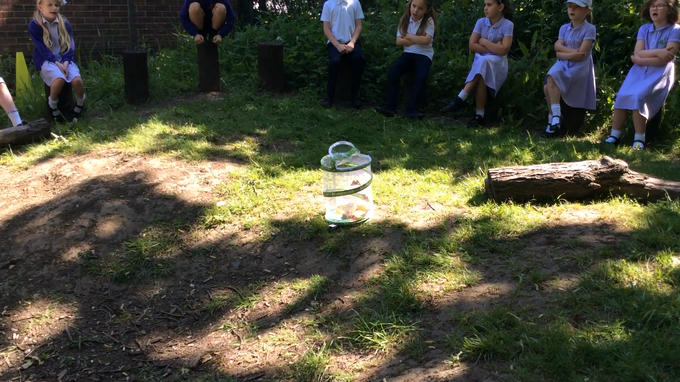 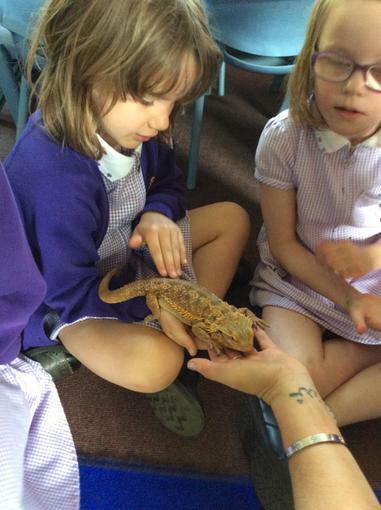 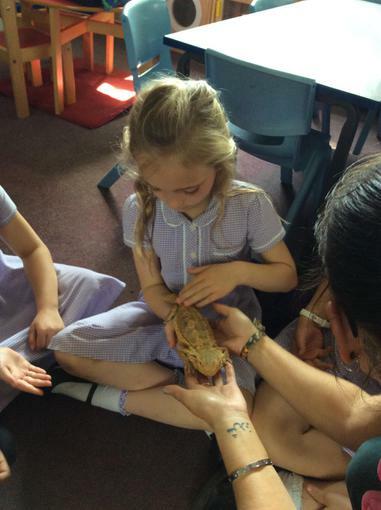 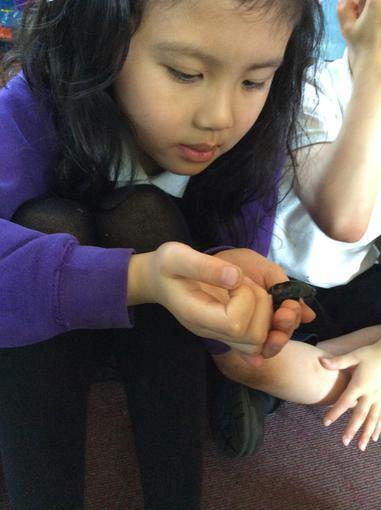 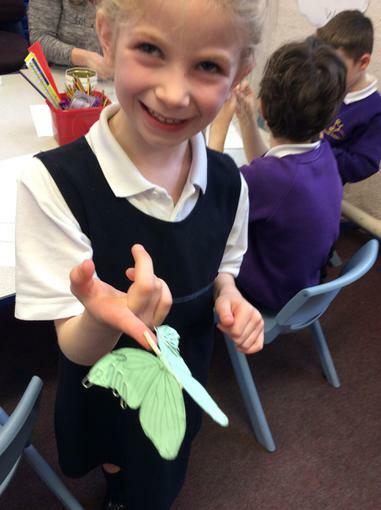 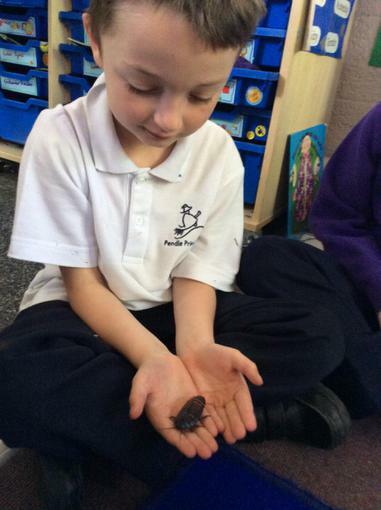 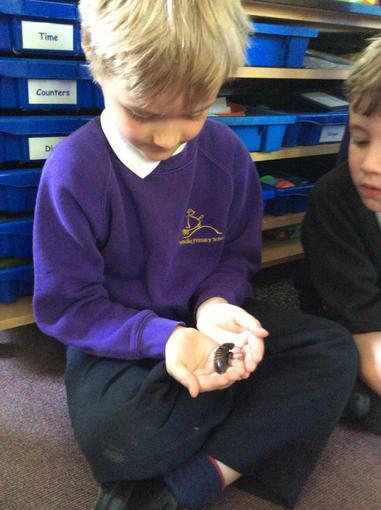 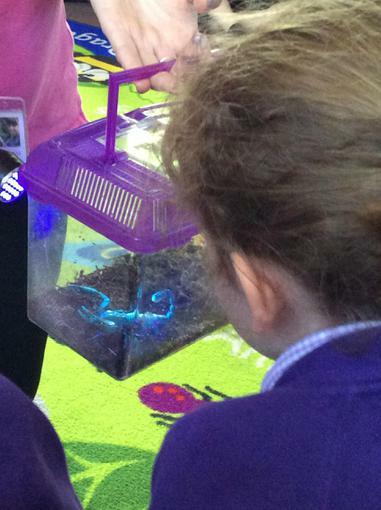 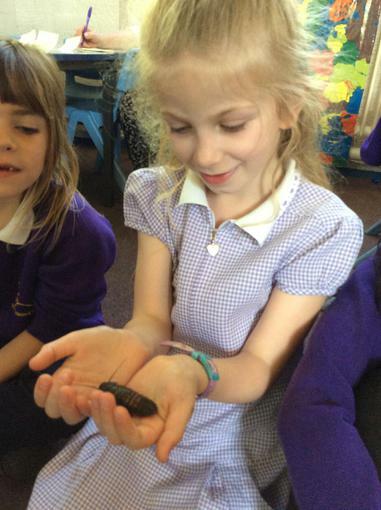 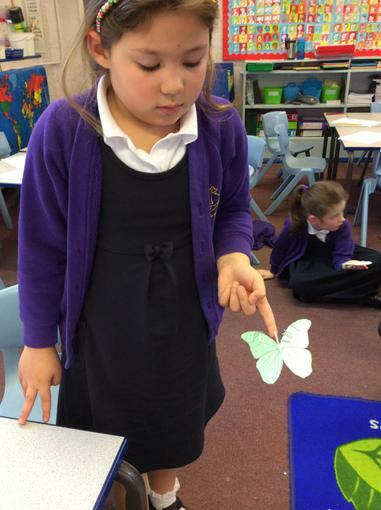 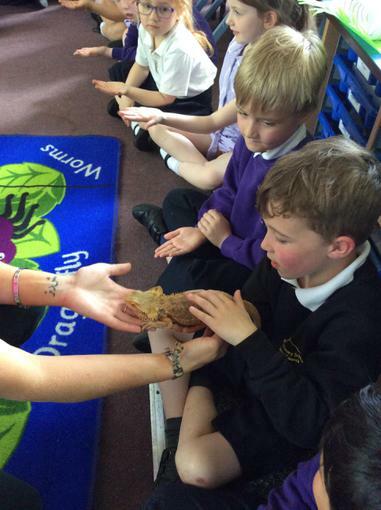 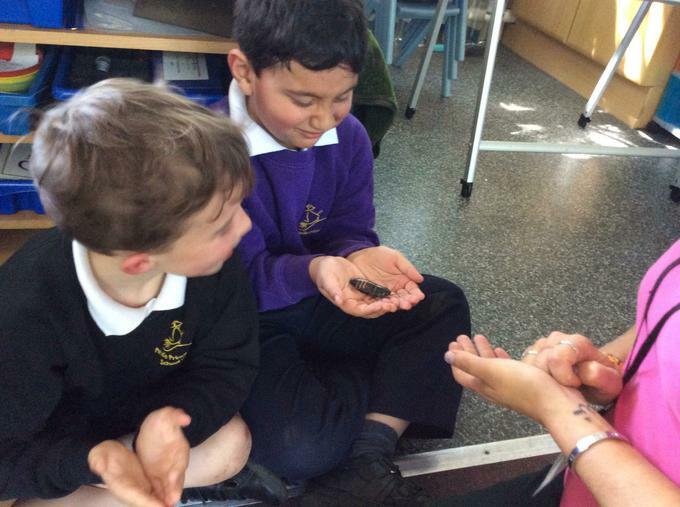 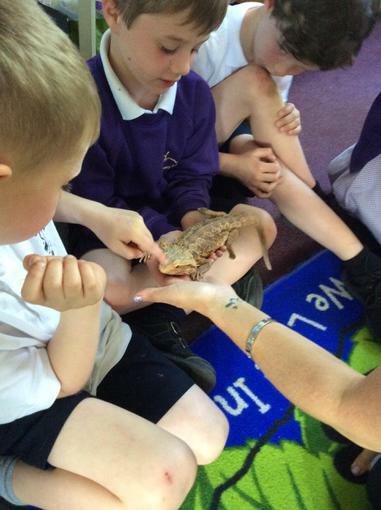 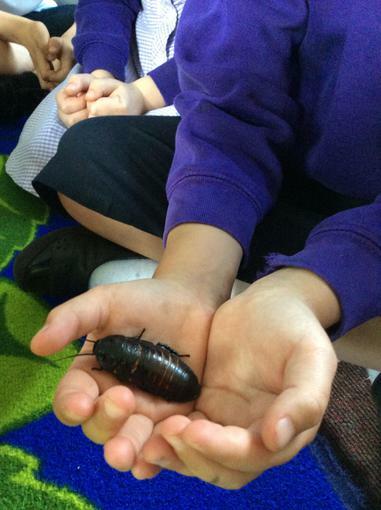 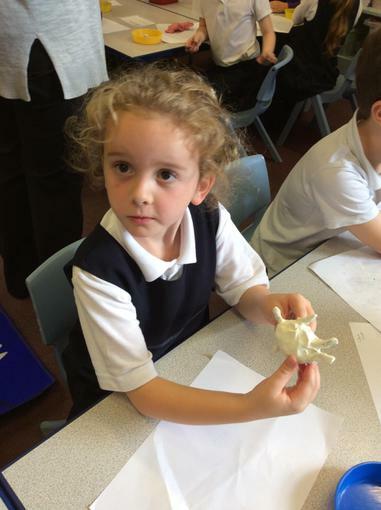 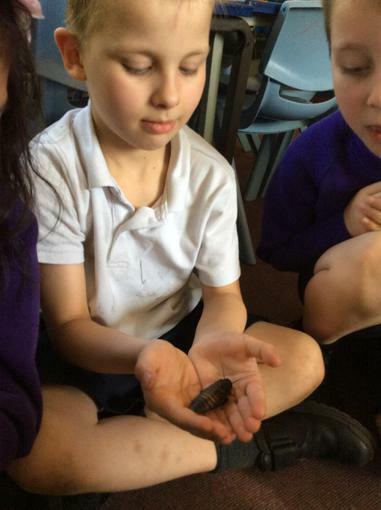 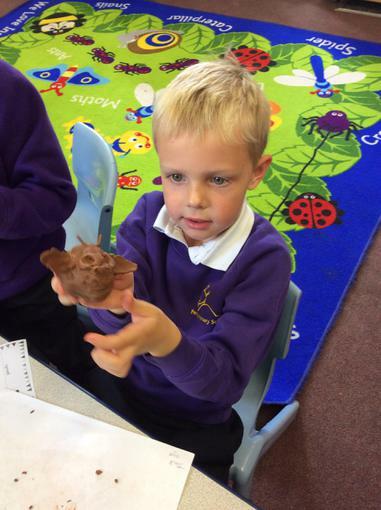 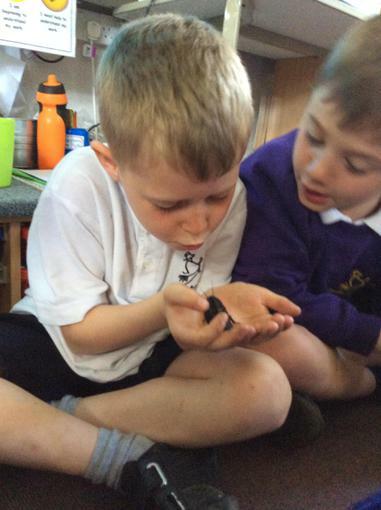 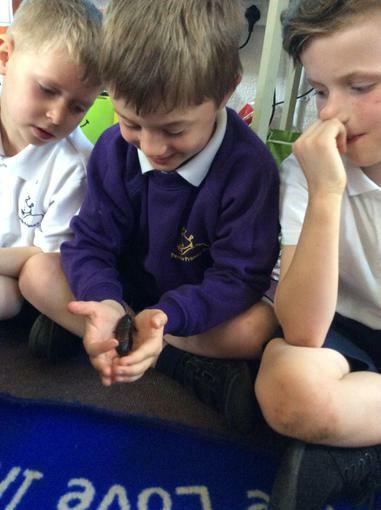 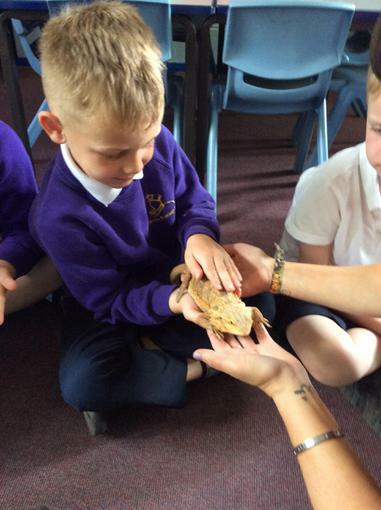 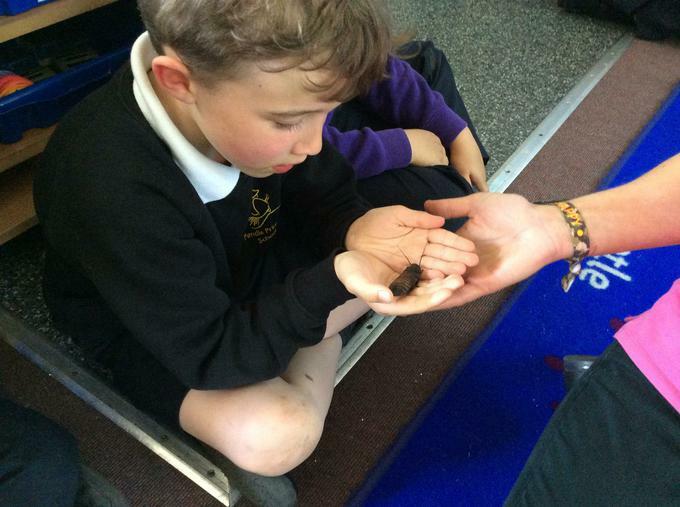 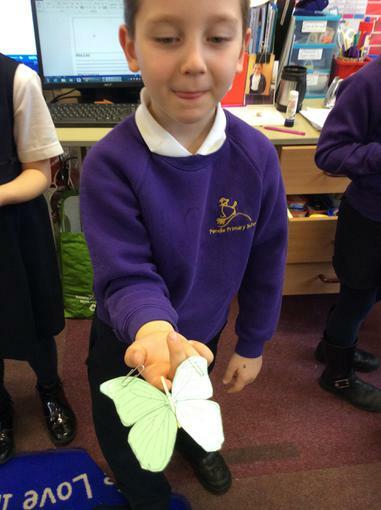 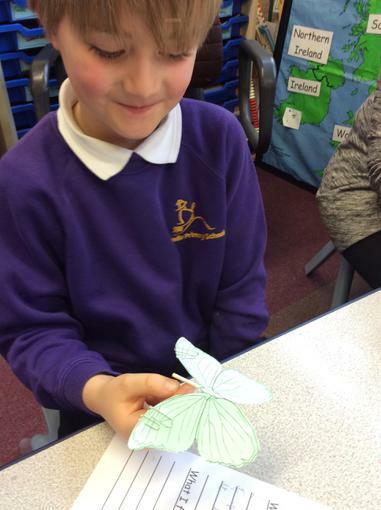 We learnt a lot about how the animals adapt and live in their different habitats. 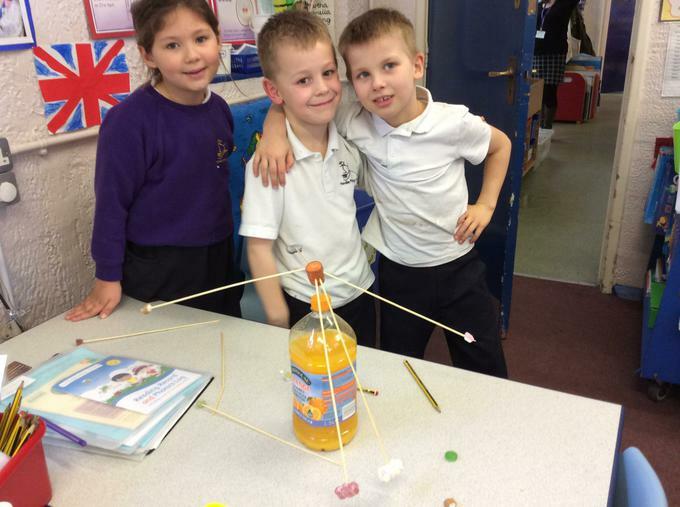 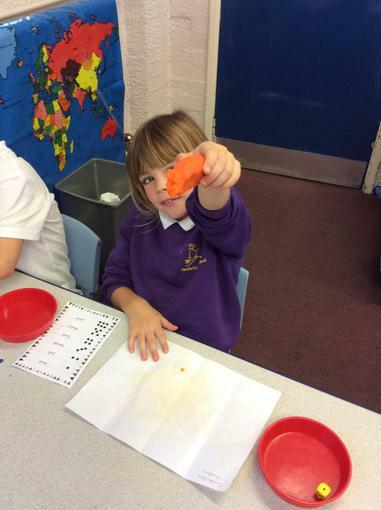 This is what they produced after a lot of experimenting! 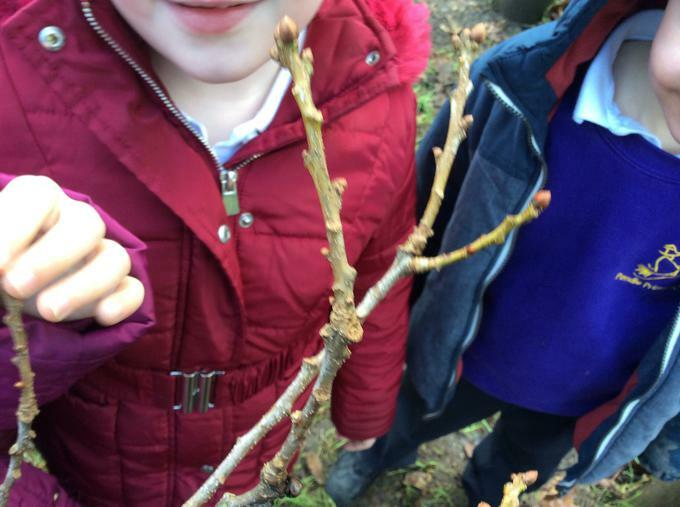 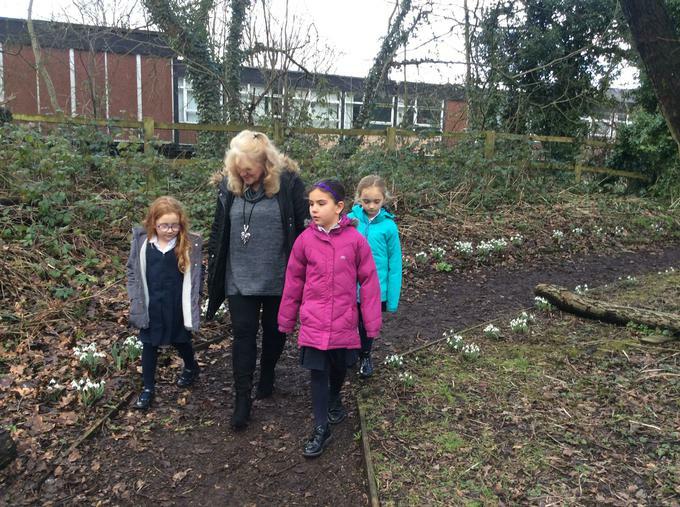 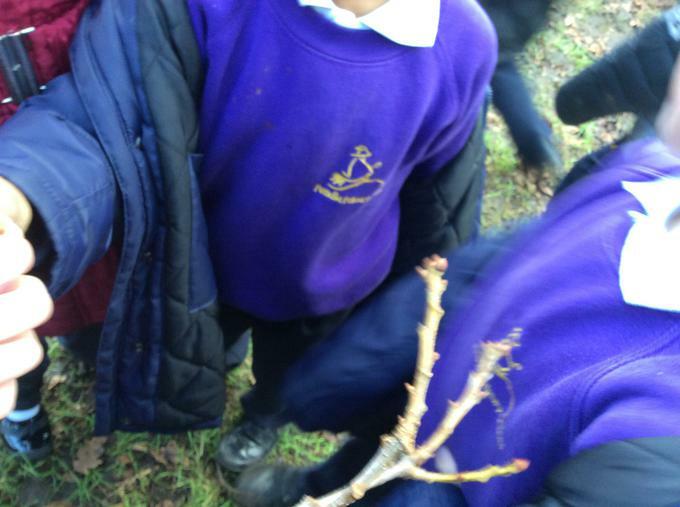 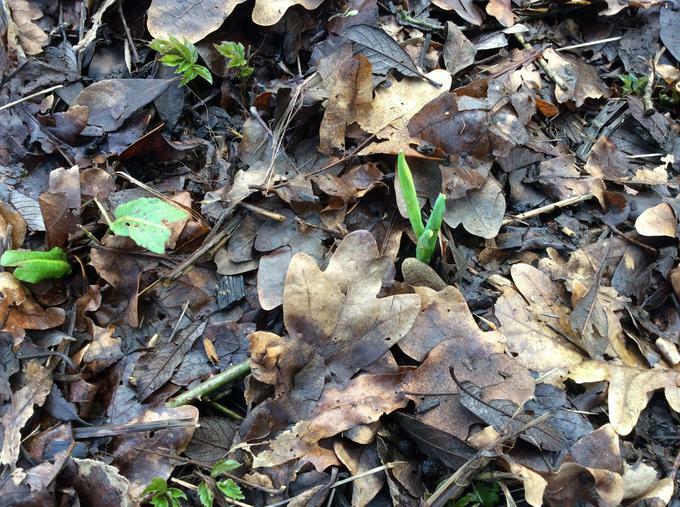 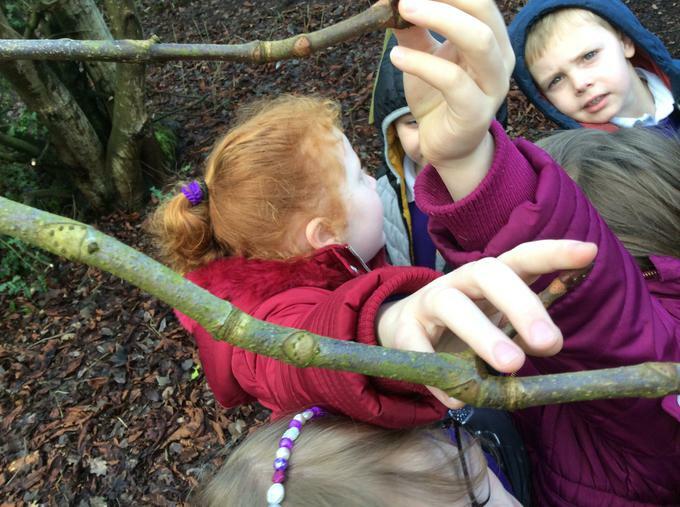 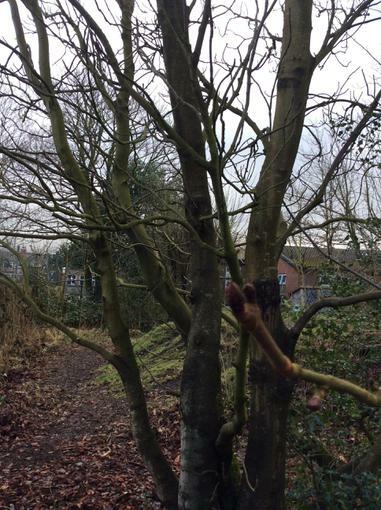 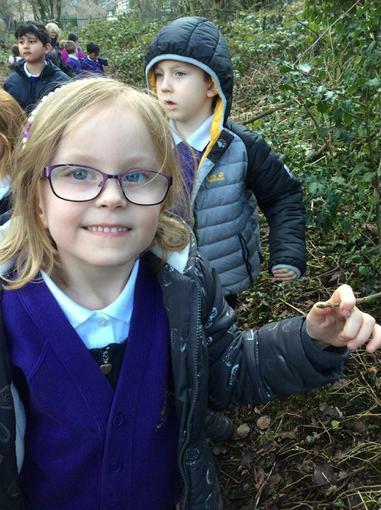 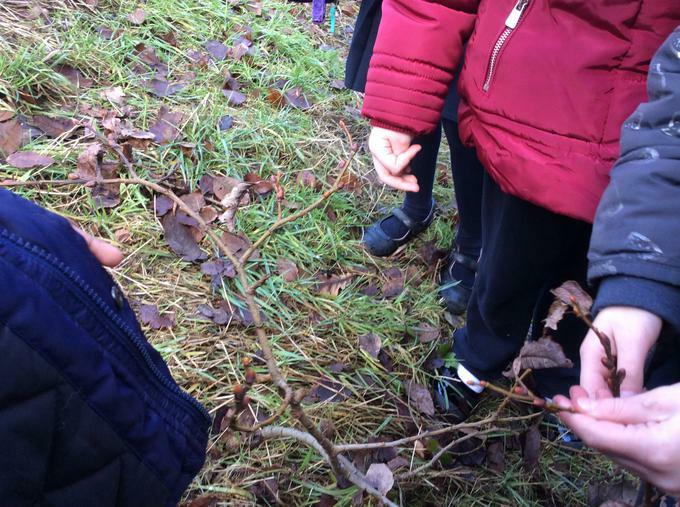 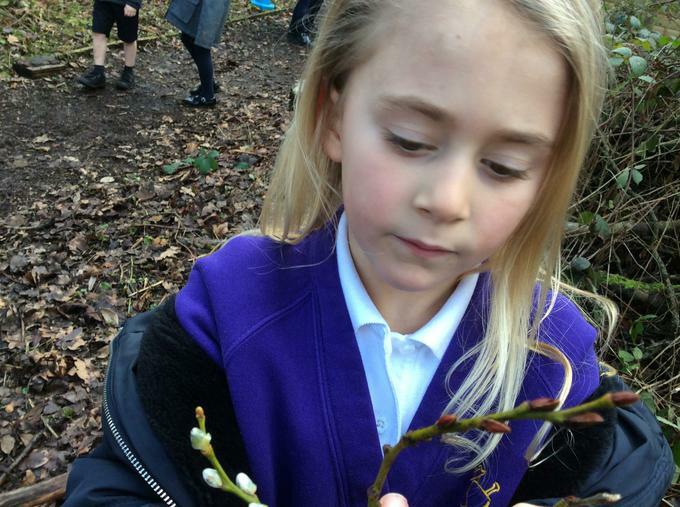 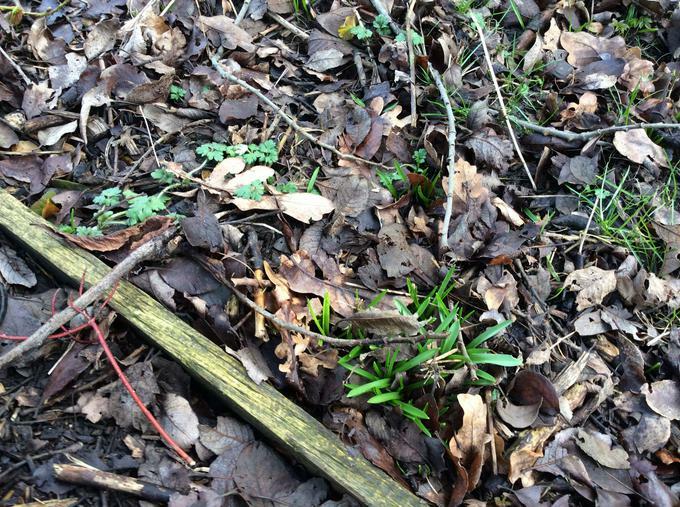 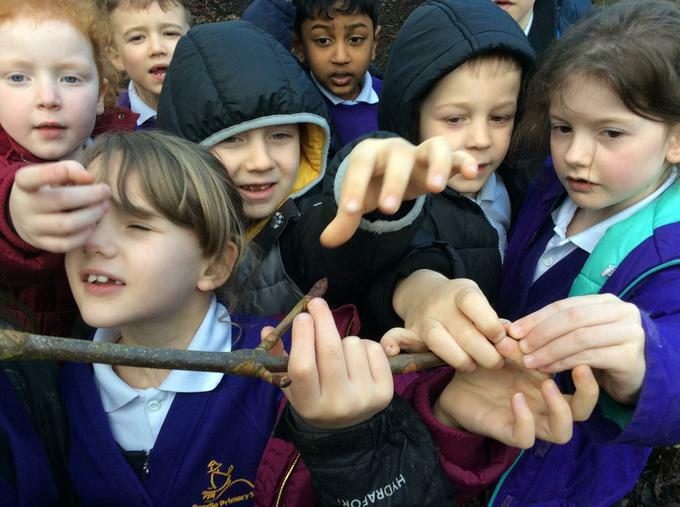 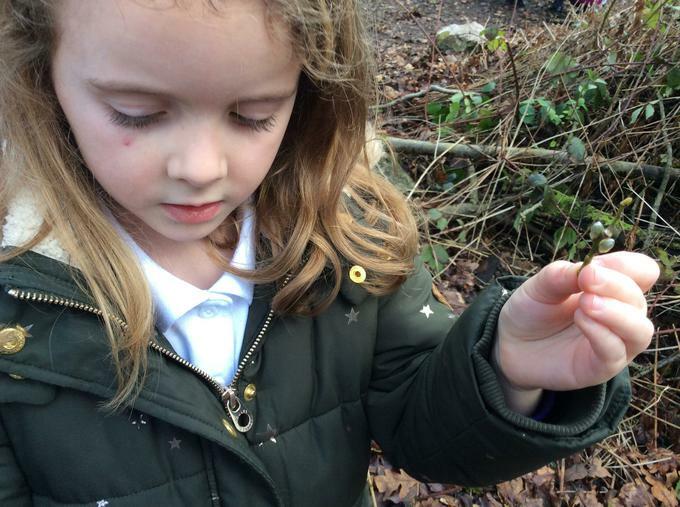 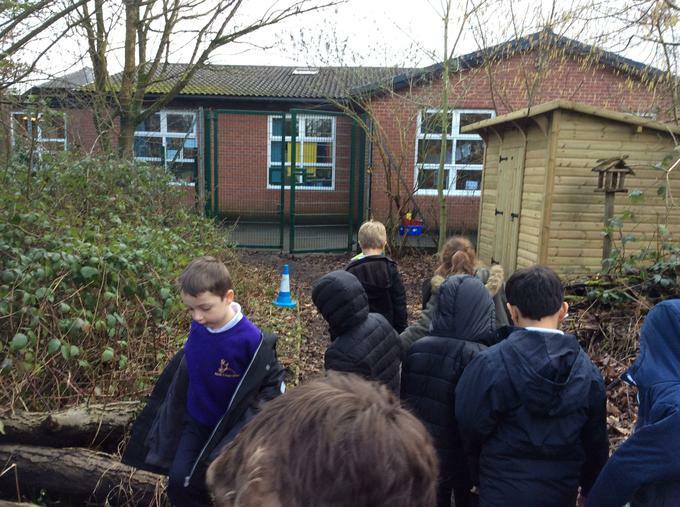 We went on a seasonal walk looking for evidence of new life in the wildlife garden. 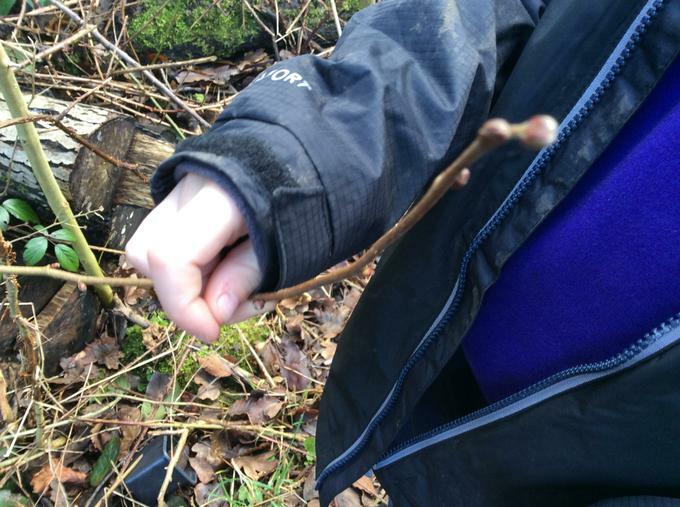 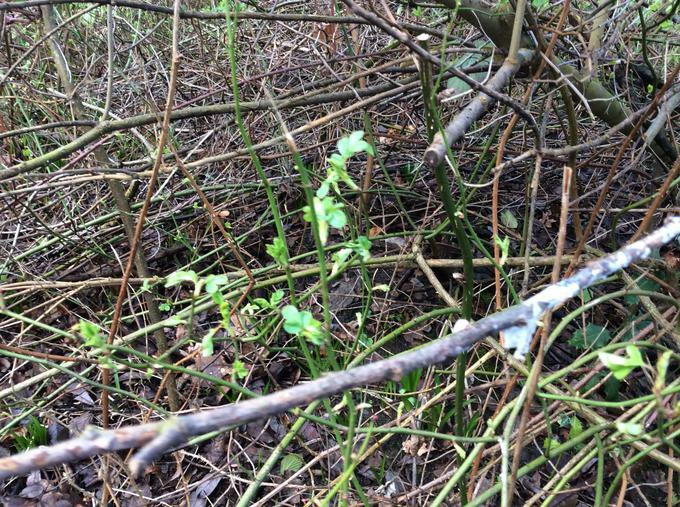 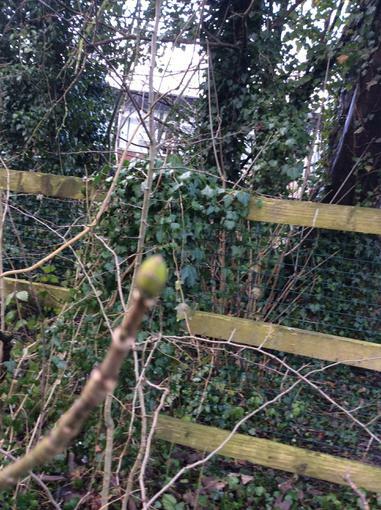 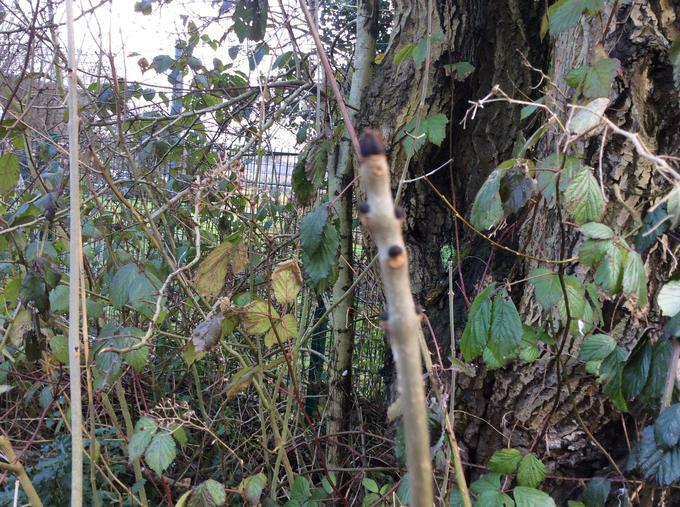 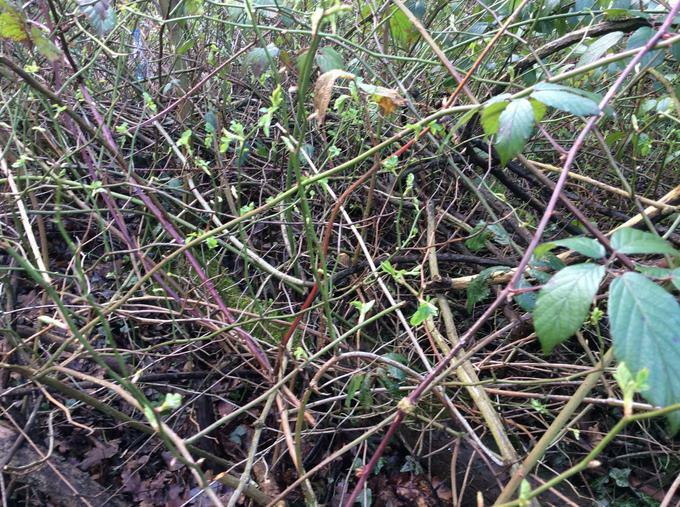 We found many shoots coming up from the ground and a variety of leaf buds on trees and on bushes. 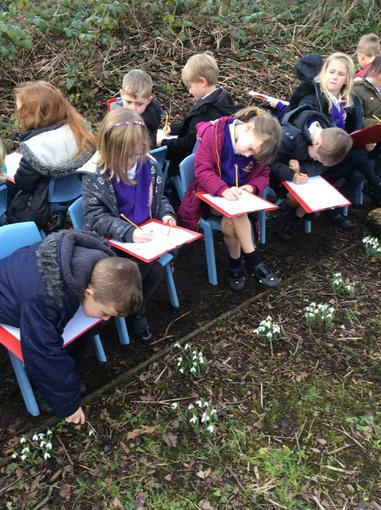 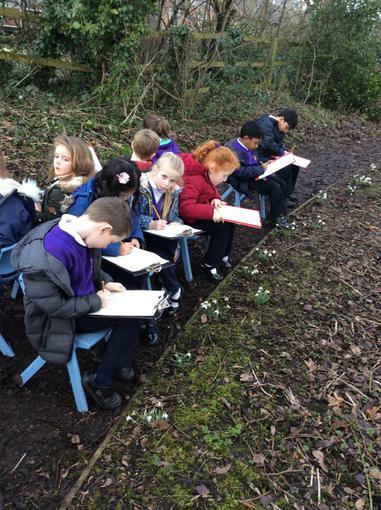 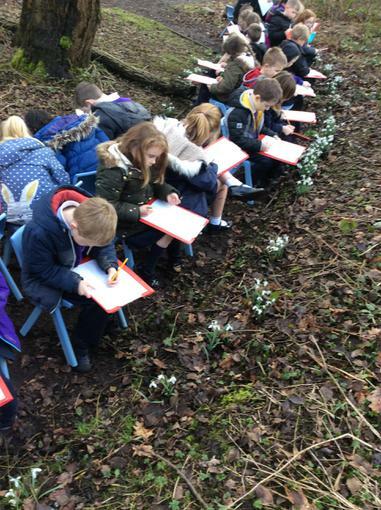 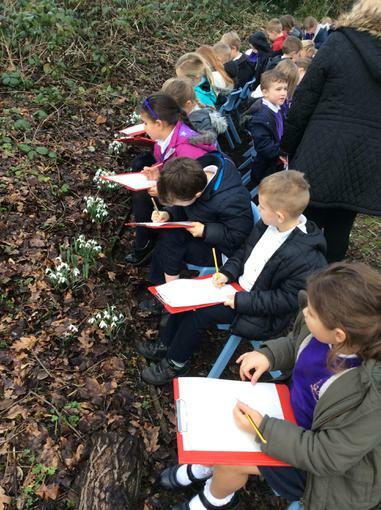 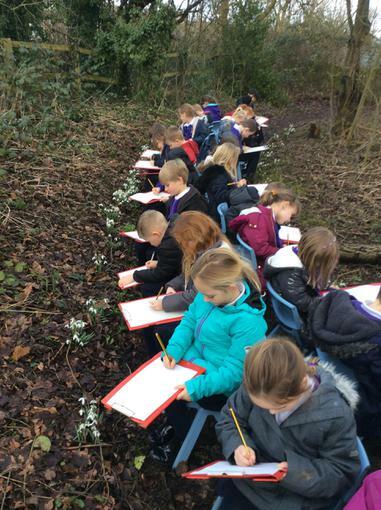 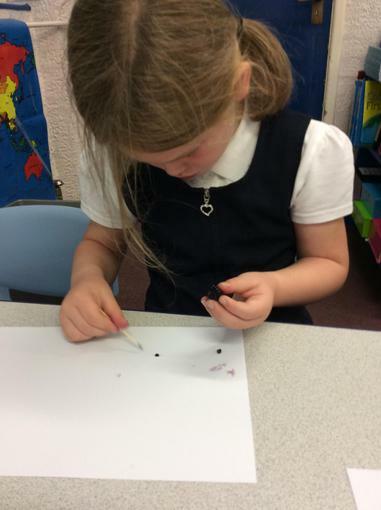 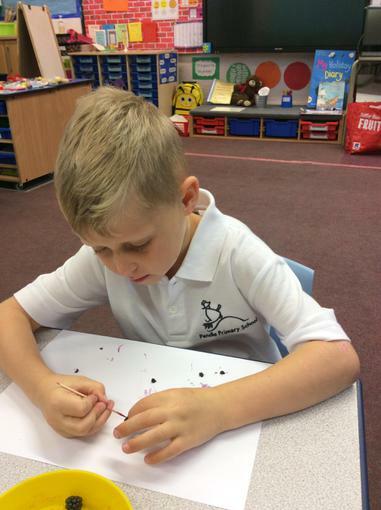 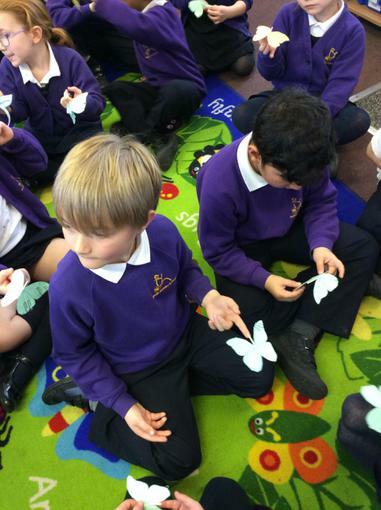 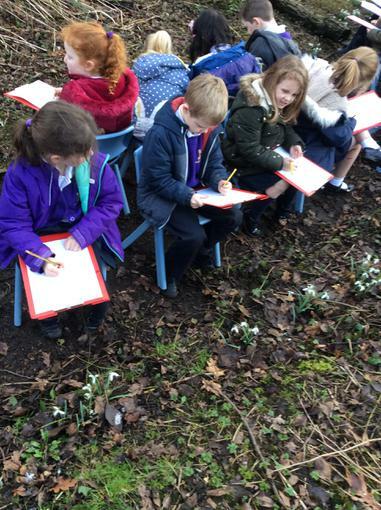 We looked closely at the snowdrops, counting the petals and taking note of the shape of the leaves before sketching them. 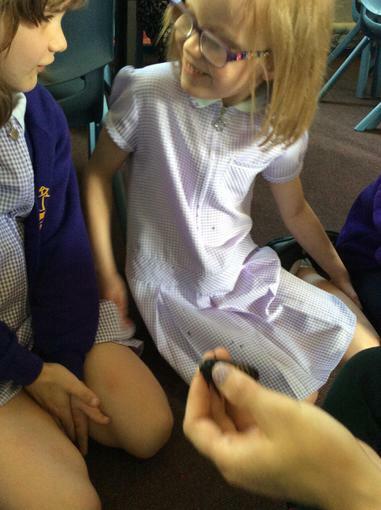 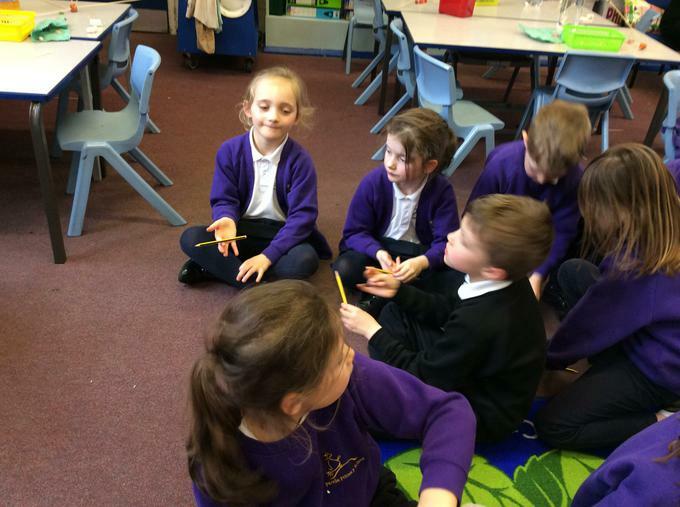 We talked about how materials can be changed. 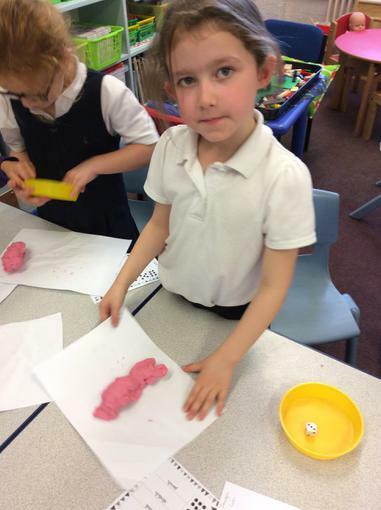 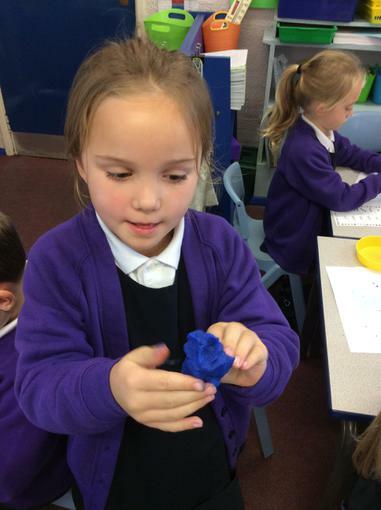 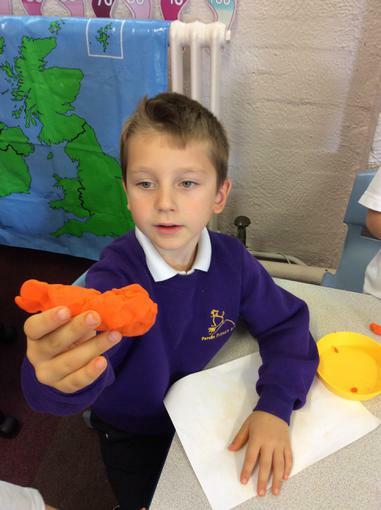 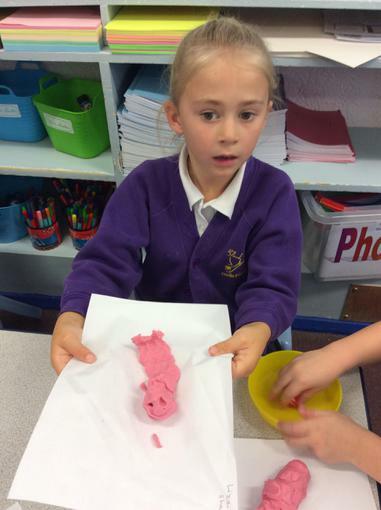 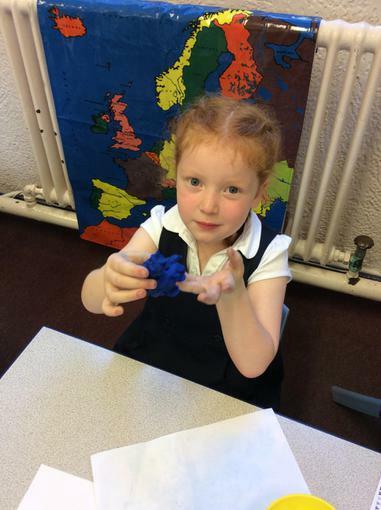 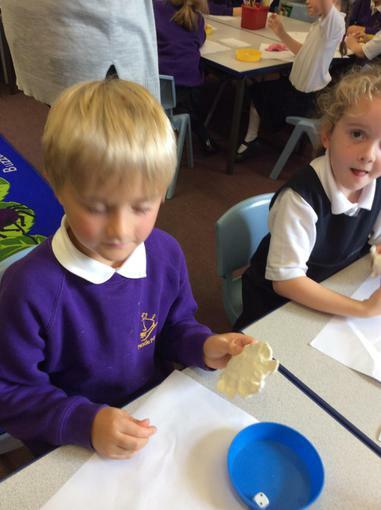 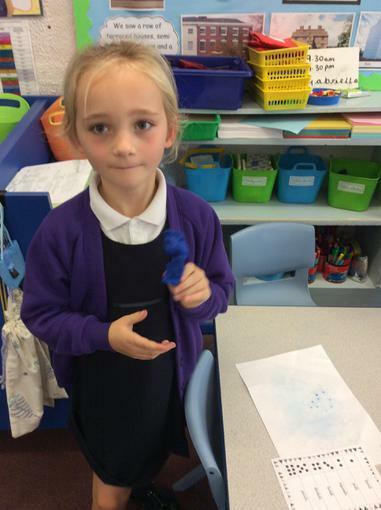 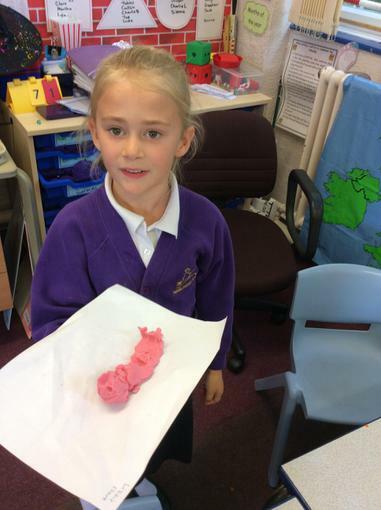 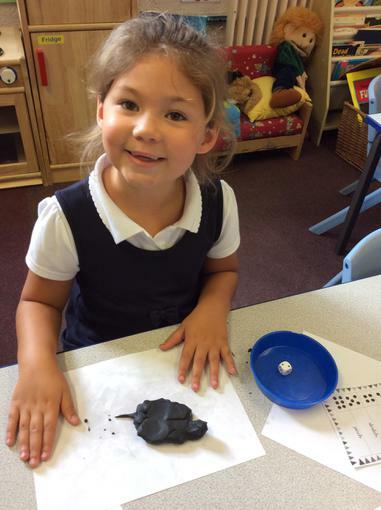 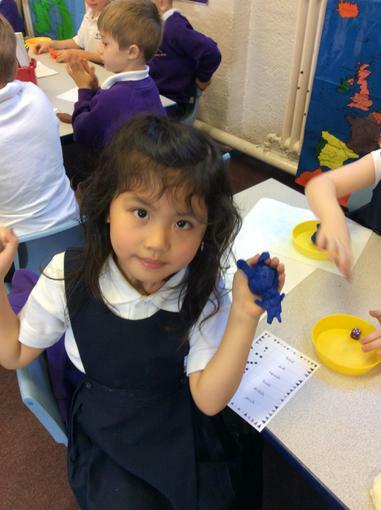 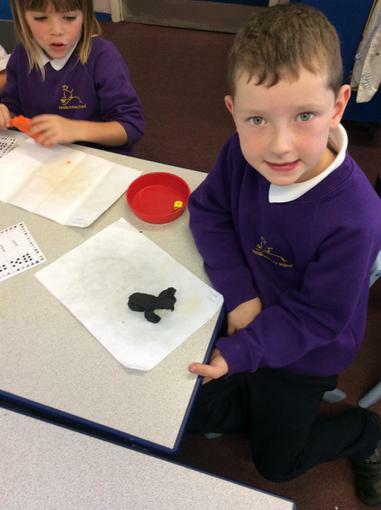 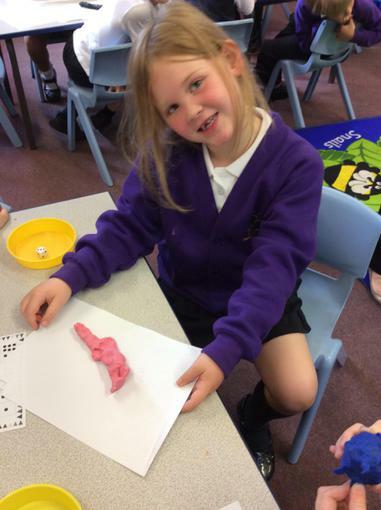 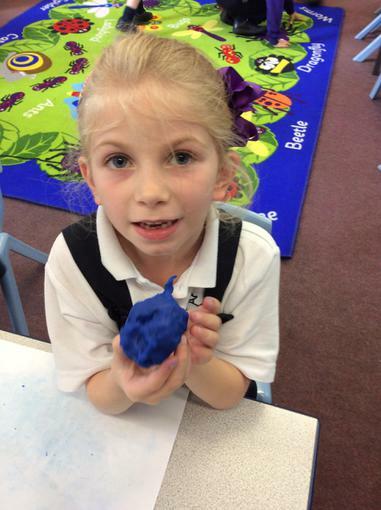 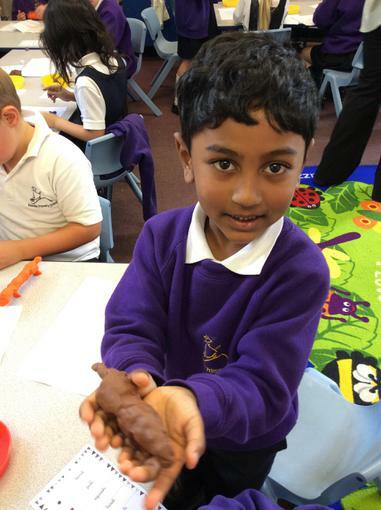 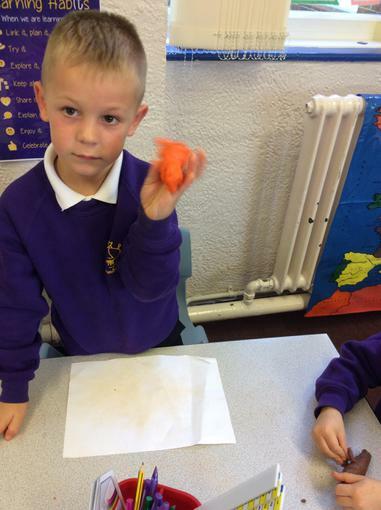 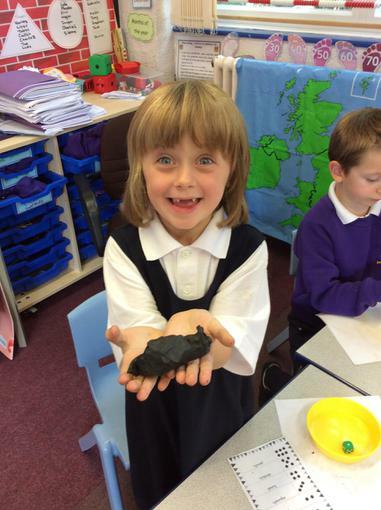 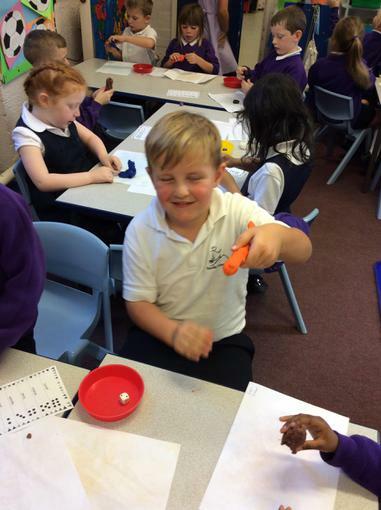 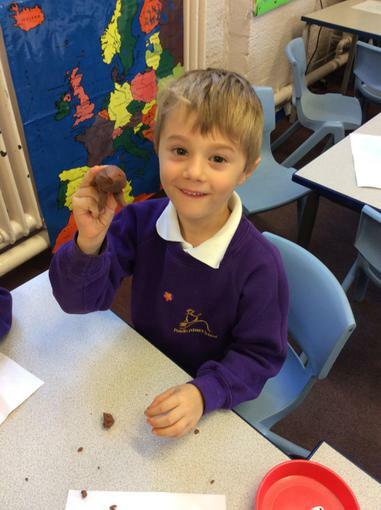 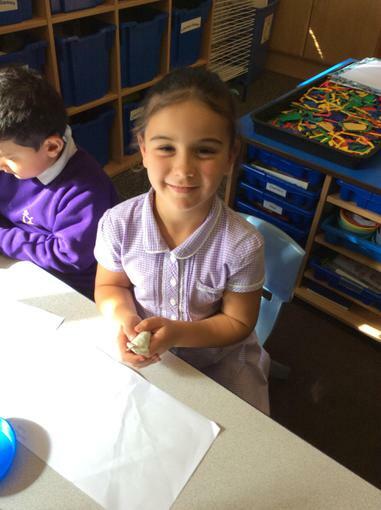 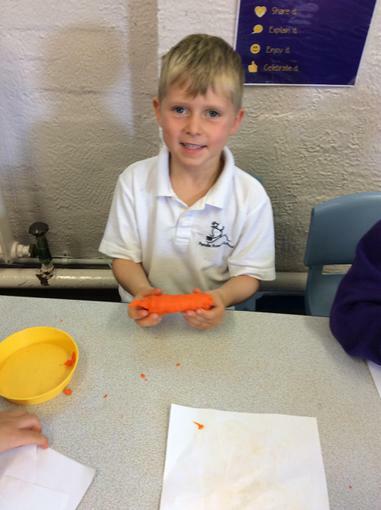 We investigated playdough. 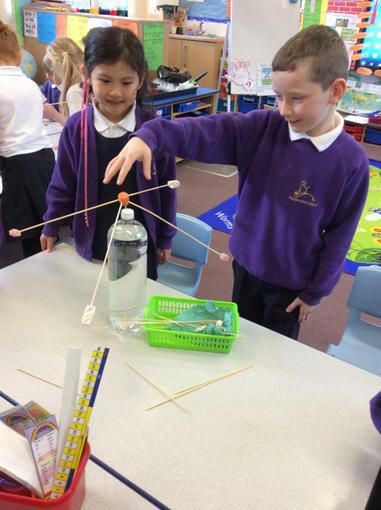 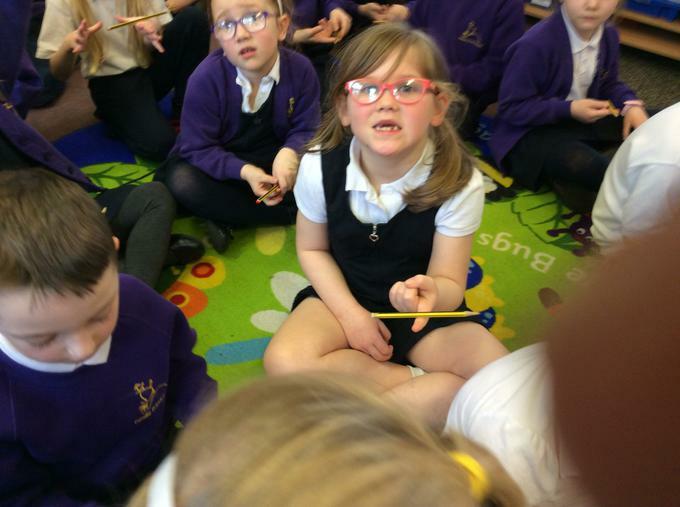 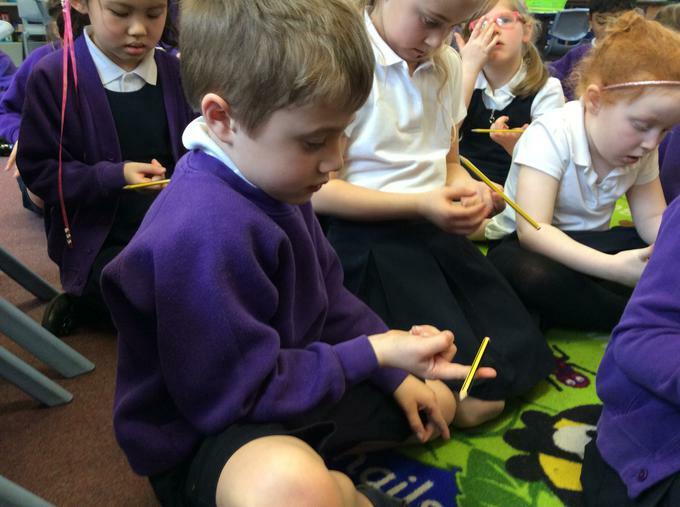 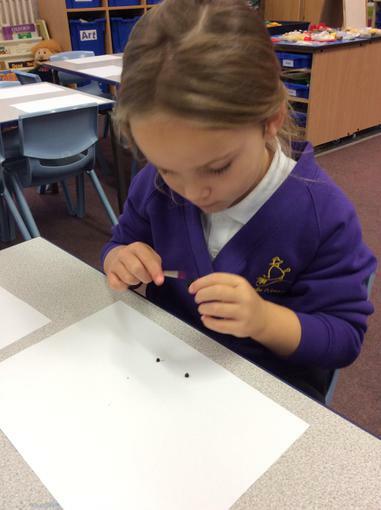 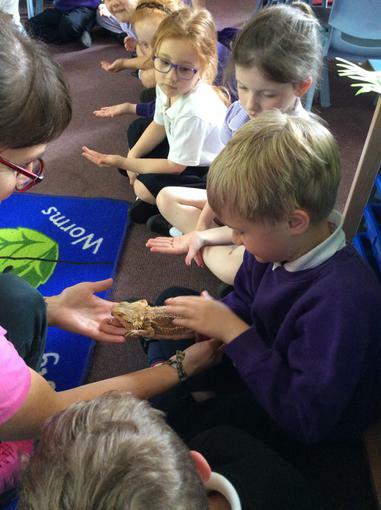 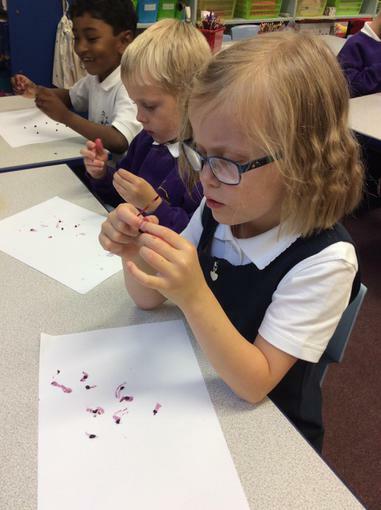 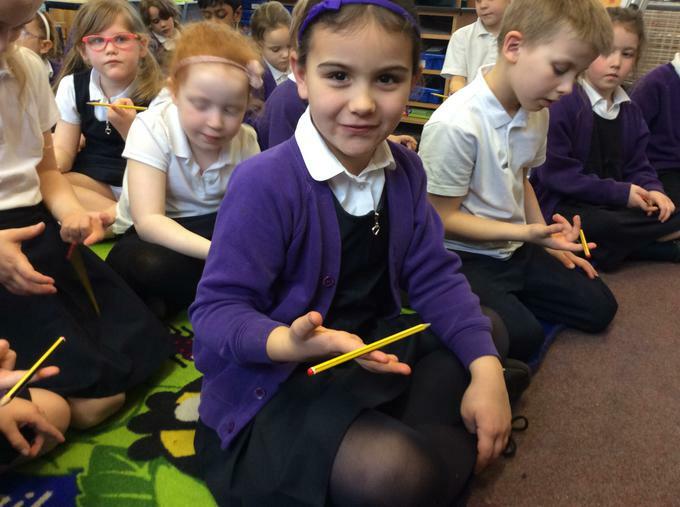 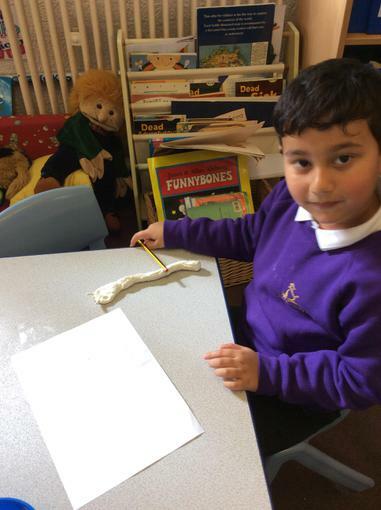 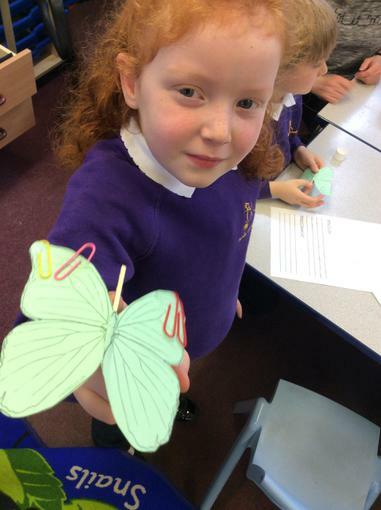 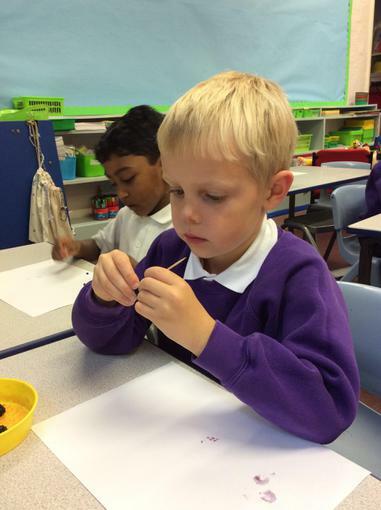 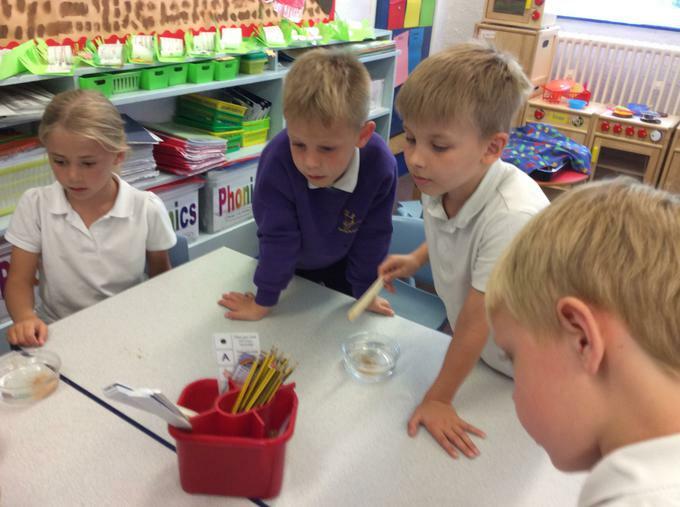 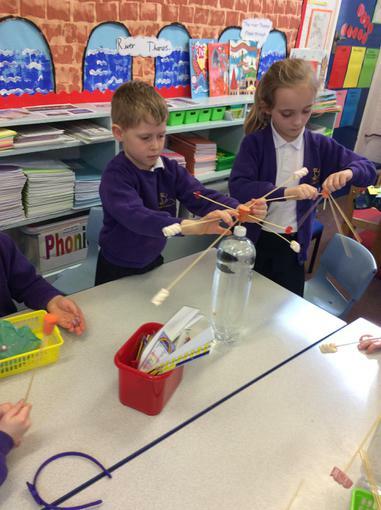 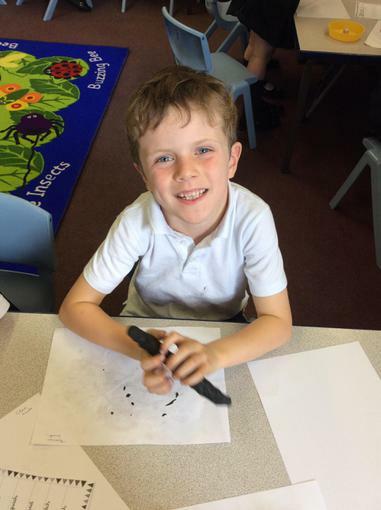 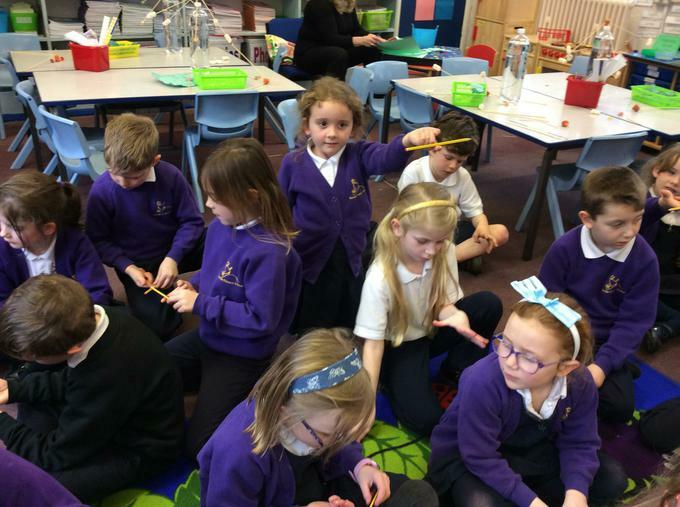 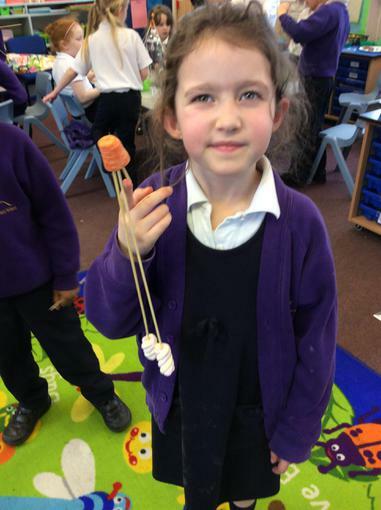 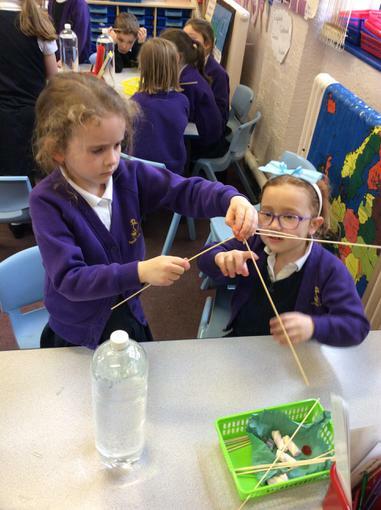 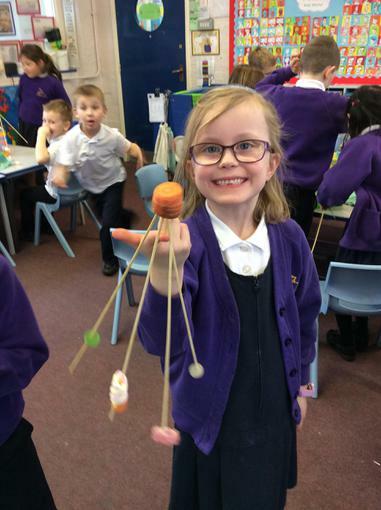 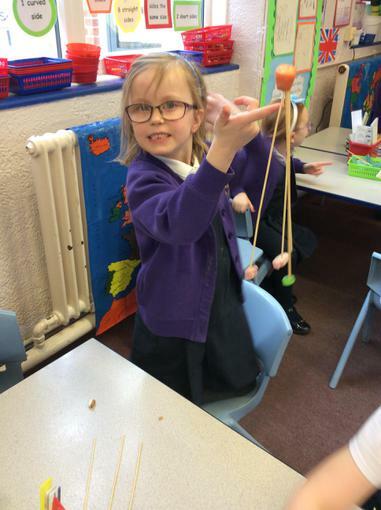 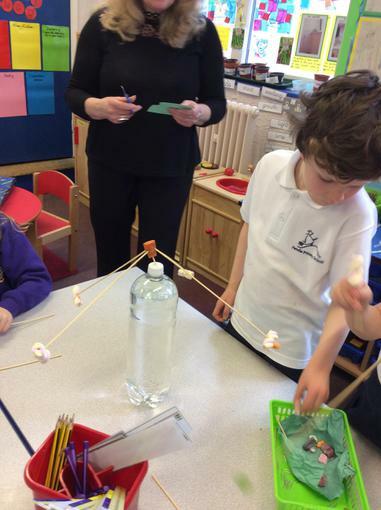 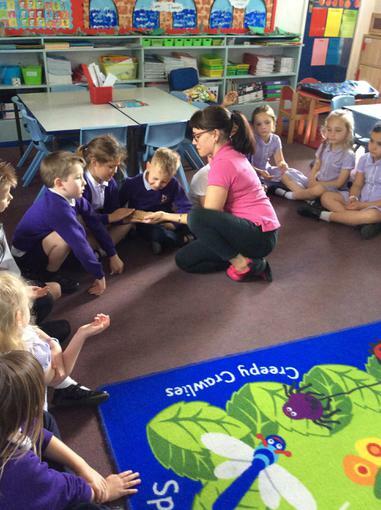 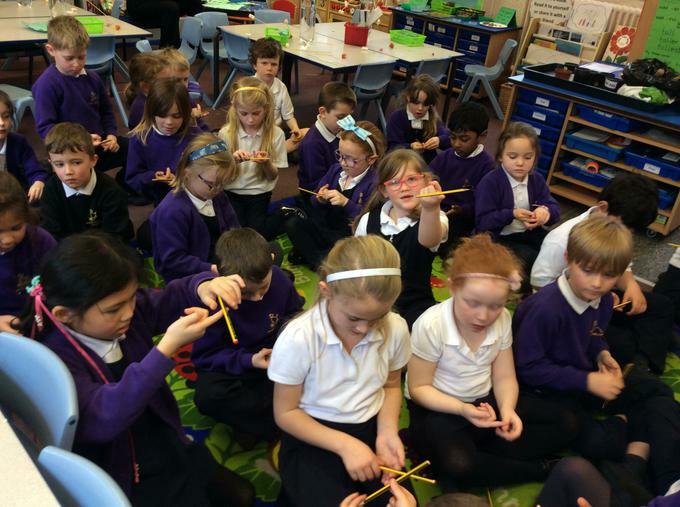 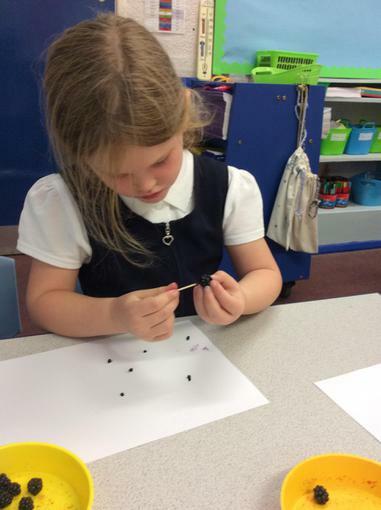 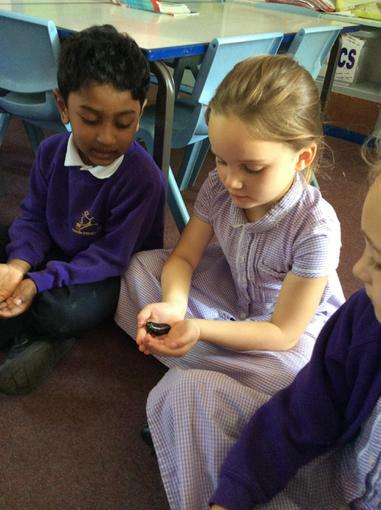 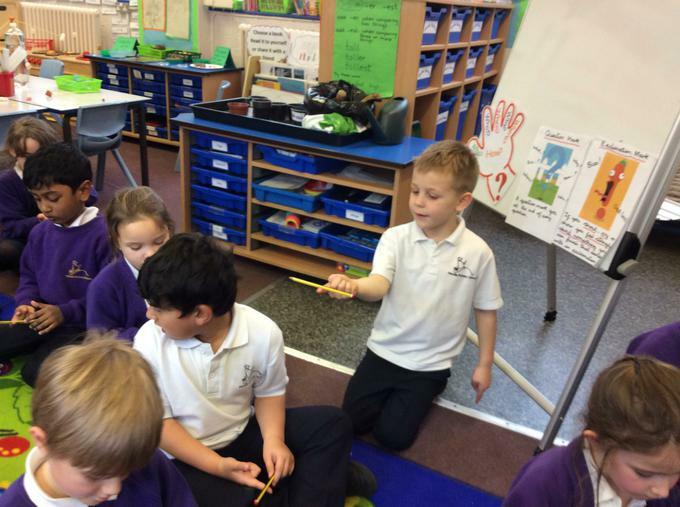 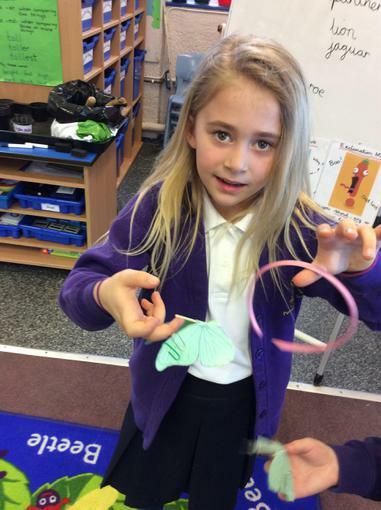 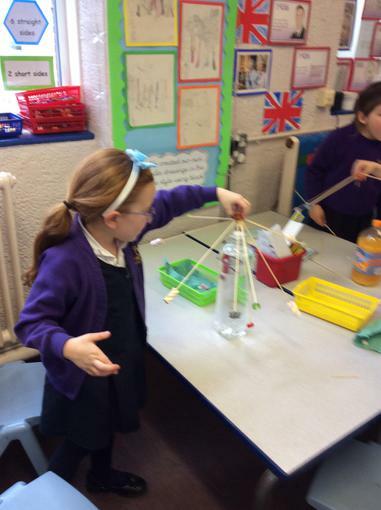 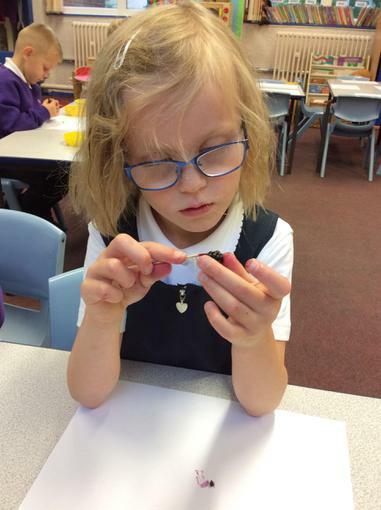 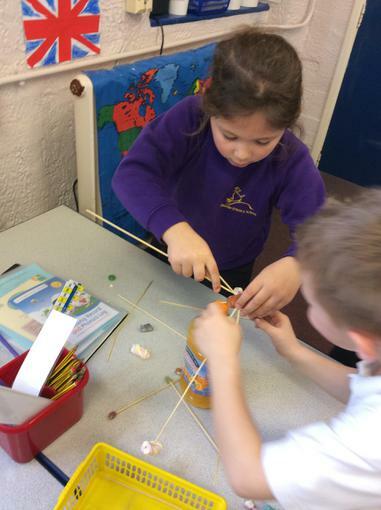 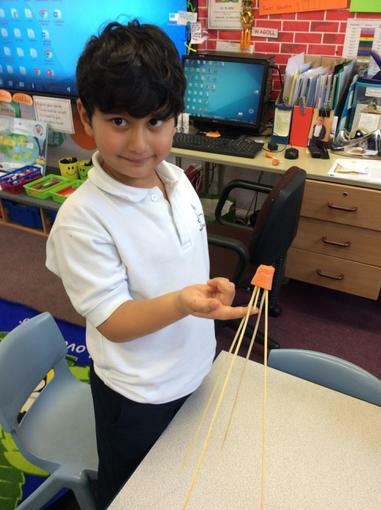 The children explored the material and offered words such as twist, stretch, press, roll and pinch to describe how it could be changed. 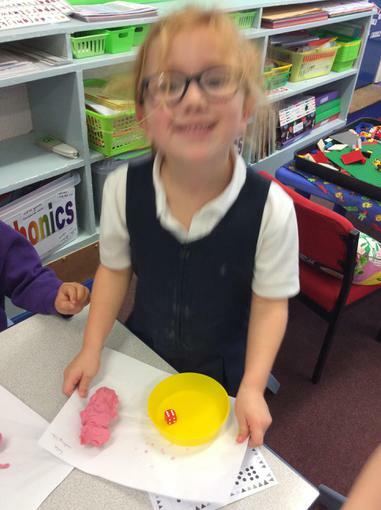 They played a game using a numbered die to instruct which action they could perform whilst trying to make a playdough creature. 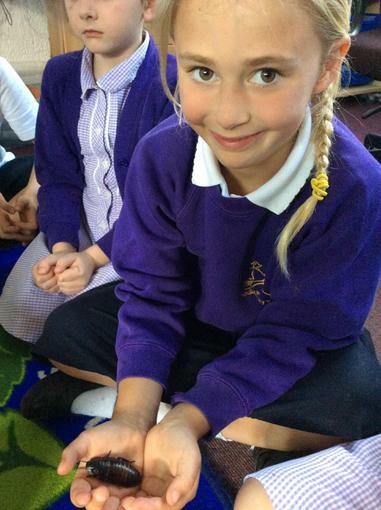 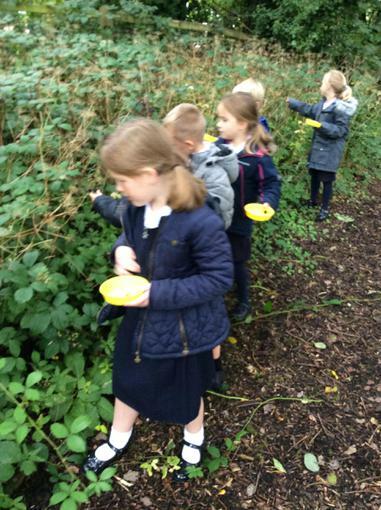 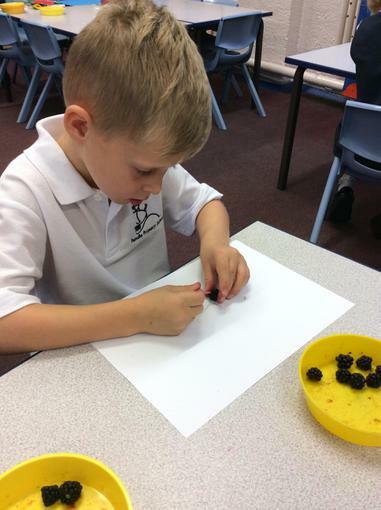 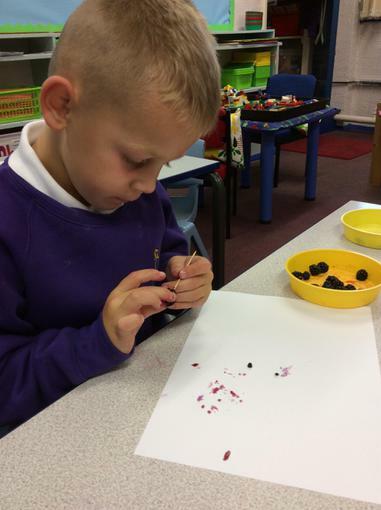 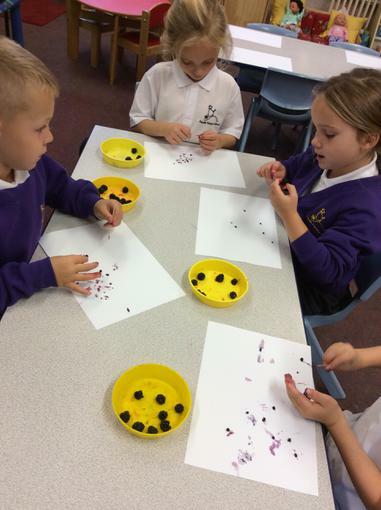 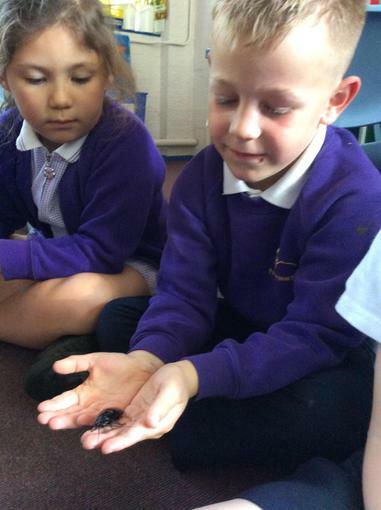 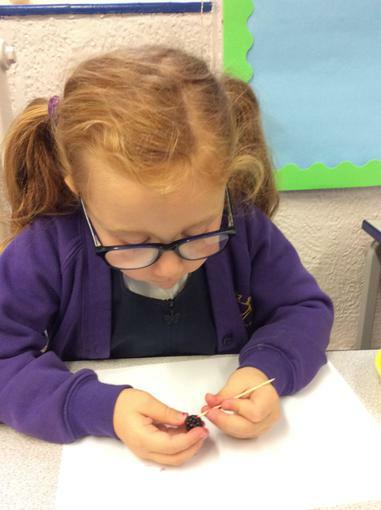 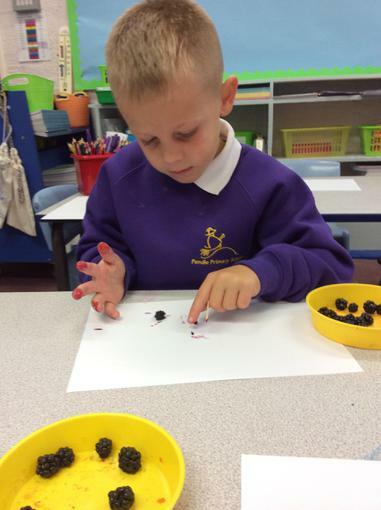 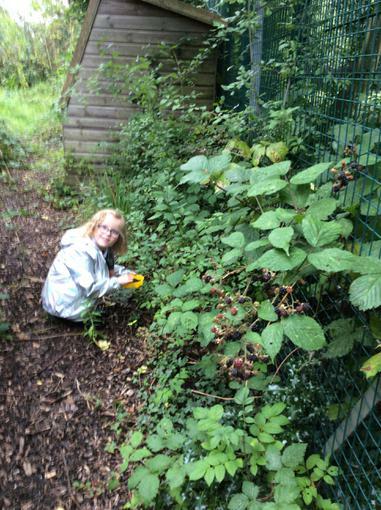 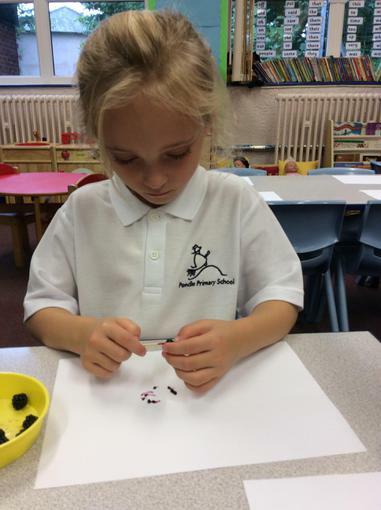 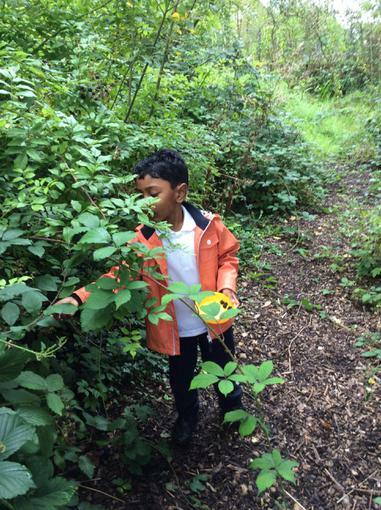 This week we have been investigating blackberries in the Wildlife Garden.